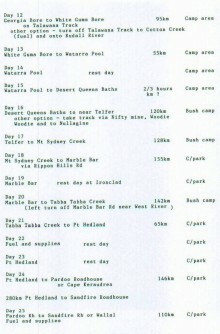 Day 1: February 19. 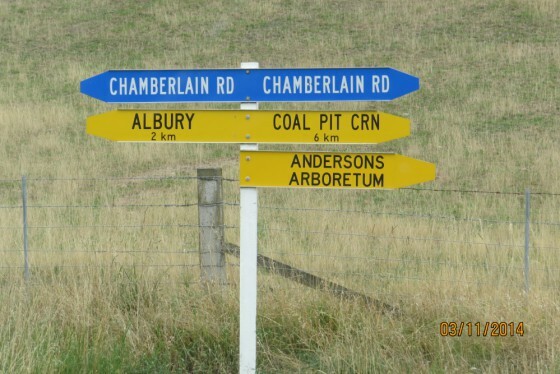 Christchurch to Amberley. The New Zealand Vintage Machinery Club kindly hosted our group for breakfast at their great facilities. This was our opportunity to meet Clare Wilkinson from the Child Cancer Foundation of NZ and finalize arrangements about our fundraising along the trek. 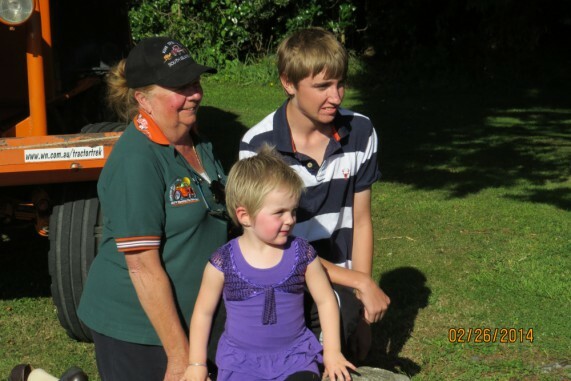 The local TV attended and conducted interviews, highlighting the work of the foundation with a child named Eddie and his mum Roxanne being filmed, and another young cancer survivor Cosmo attending with his Mum. After this great start to the day, our group headed to Kaiapoi for a quick look at the interesting ‘M.V. 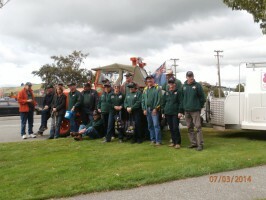 Tuhoe’, a link with the history of the area, then continued on to the home of NZ tractor enthusiasts Graeme and Helen at Flaxton, where a light lunch wasprovided. 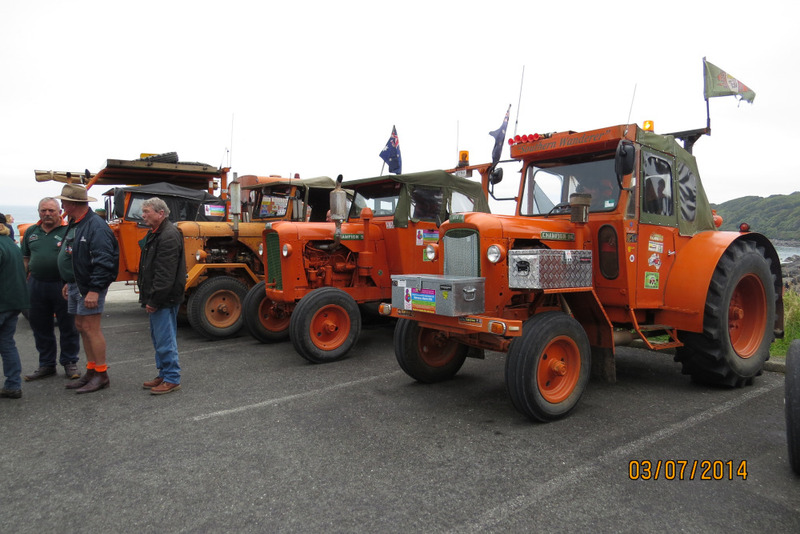 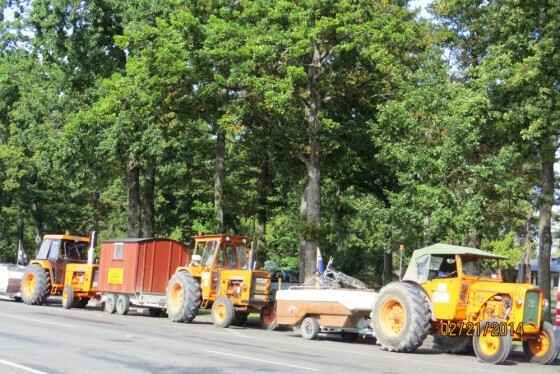 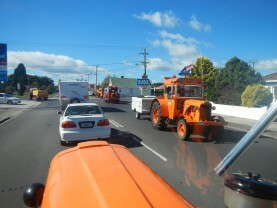 Much interest was shown in the group of 16 tractors as they headed to Amberley for the overnight stop. 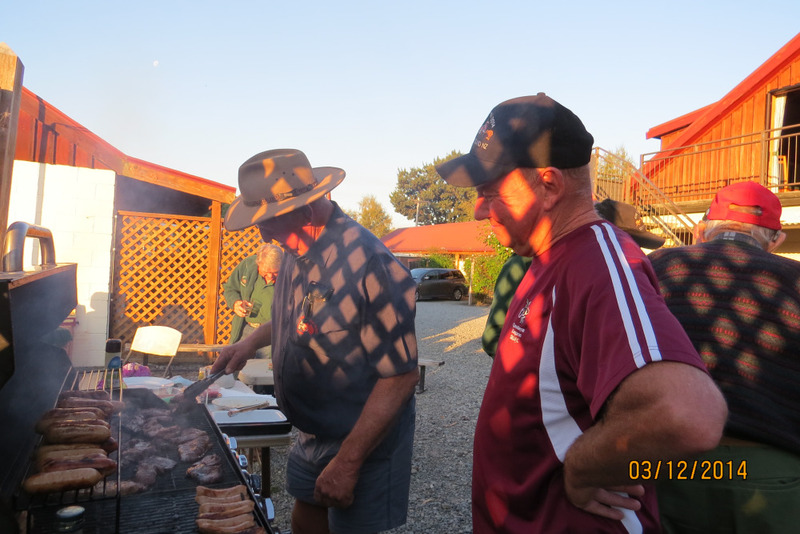 Dinner had been arranged by the Mayor, Winton Dalley, at the local Rugby Club, with a wonderful meal provided by the Broomfield Primary School. 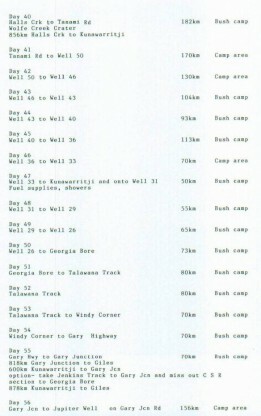 Day 2: February 20. 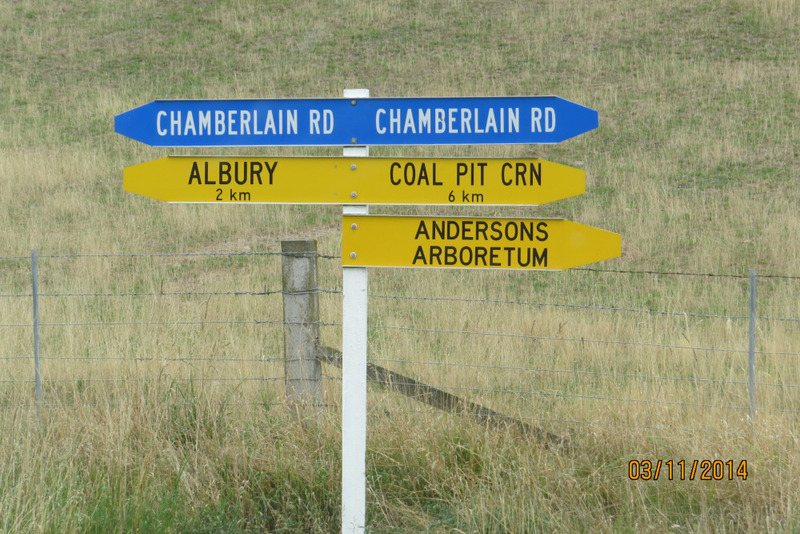 Amberley to Hanmer Springs. 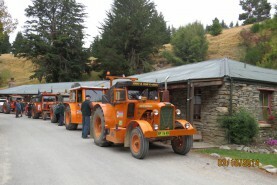 The convoy left the overnight accommodation at 9.00am and headed north. 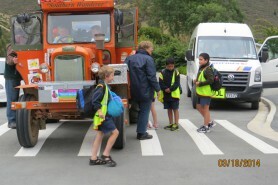 First stop was at the Amberley Council, then to visit the children at the Broomfield School. 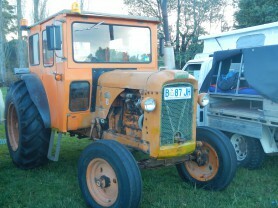 Kids always love the big orange tractors and were enthusiastic to have them visit. 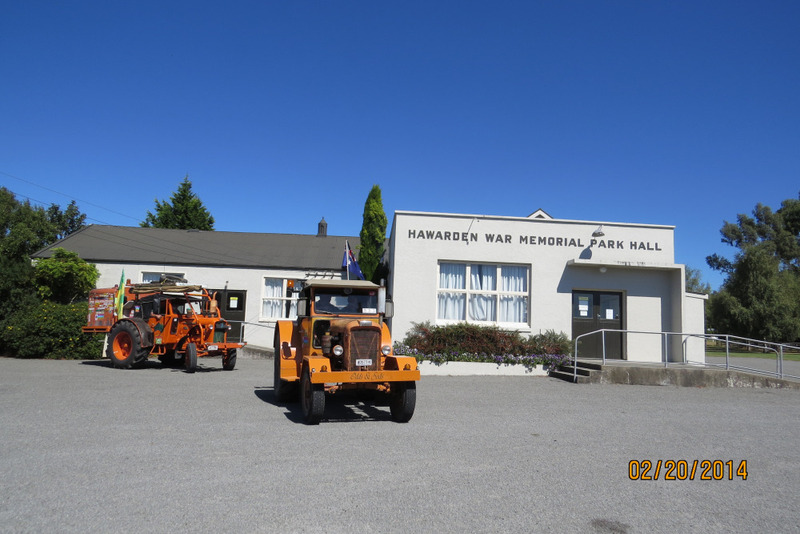 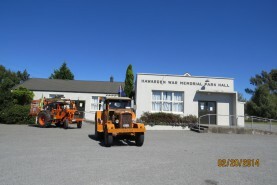 Next stop was at the Hawarden War Memorial Park Hall, before continuing through the picturesque hilly country to Hurunui Village for the lunch stop. Two vehicles from the trek stopped to catch up with a group of excited youngsters, just about to leave their weekly playgroup at Medbury Hall, before joining the rest of the trekkers for a delicious lunch and a quick look at the oldest pub in New Zealand and a very novel wine cave where the temperature keeps at a steady 12 degrees. 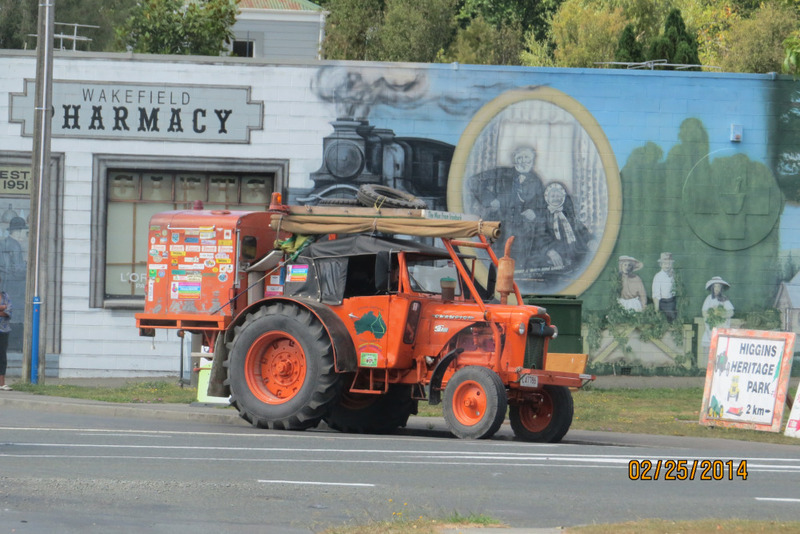 The afternoon run meandered around the countryside to Culverden and Waiau before taking a local road back to Hanmer Springs. 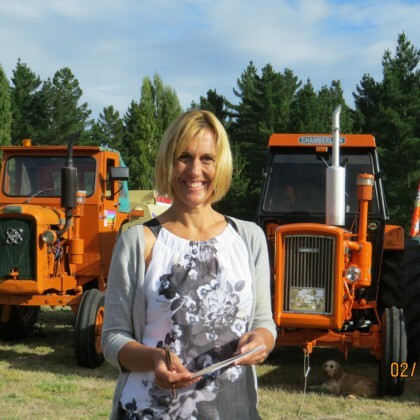 Mayor Dalley had again arranged for us to have a group dinner, this time at the fantastic Hanmer Springs Spa where we enjoyed a great meal at the Spa Café overlooking the many thermal pools. 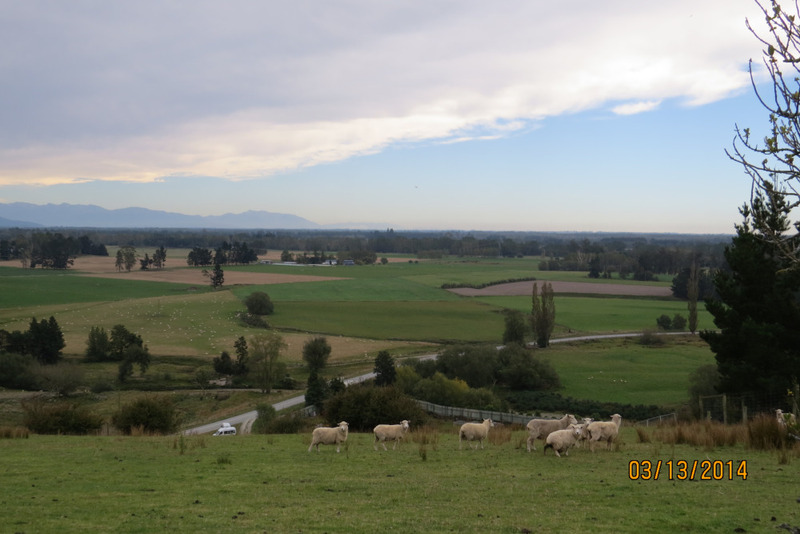 The afternoon run meandered around the countryside to Culverden and Waiau before taking a local road back to Hanmer Springs. 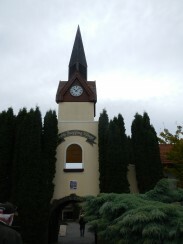 Mayor Dalley had again arranged for us to have a group dinner, this time at the fantastic Hanmer Springs Spa where we enjoyed a great meal at the Spa Café overlooking the many thermal pools. 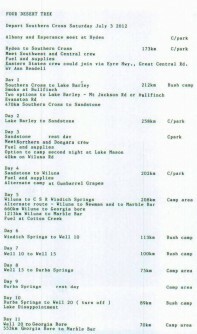 Day 3: February 21. Hanmer Springs to Blenheim. 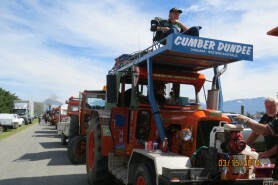 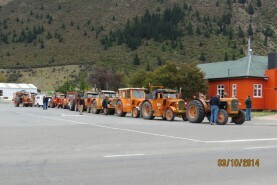 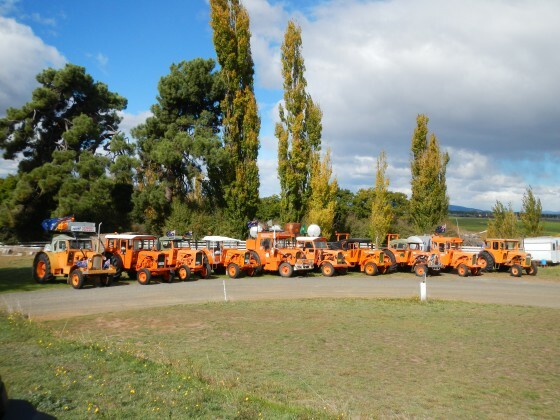 The main group of tractors set off from Hanmer Springs by 8.00am heading for Molesworth Station. 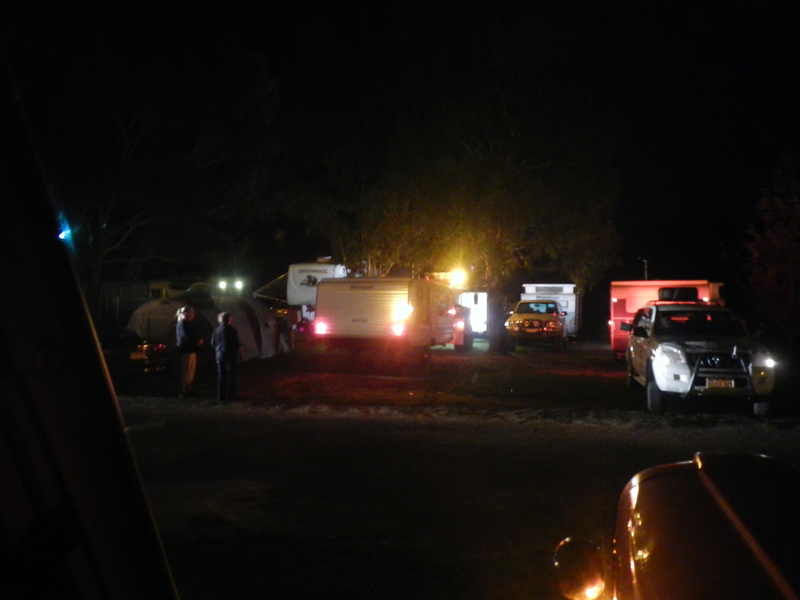 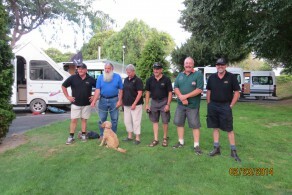 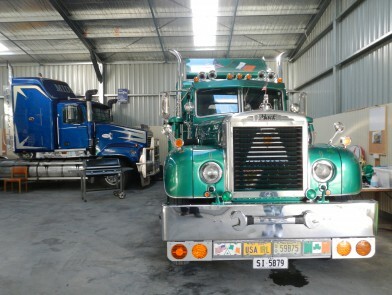 Meanwhile most of the New Zealand contingent and the motor homes remained behind so that repairs could be carried out to one of the NZ group’s trailer. Hanmer Springs is a very pretty town and it was good to have a bit of extra time to look around, before heading off together at 10.45am. 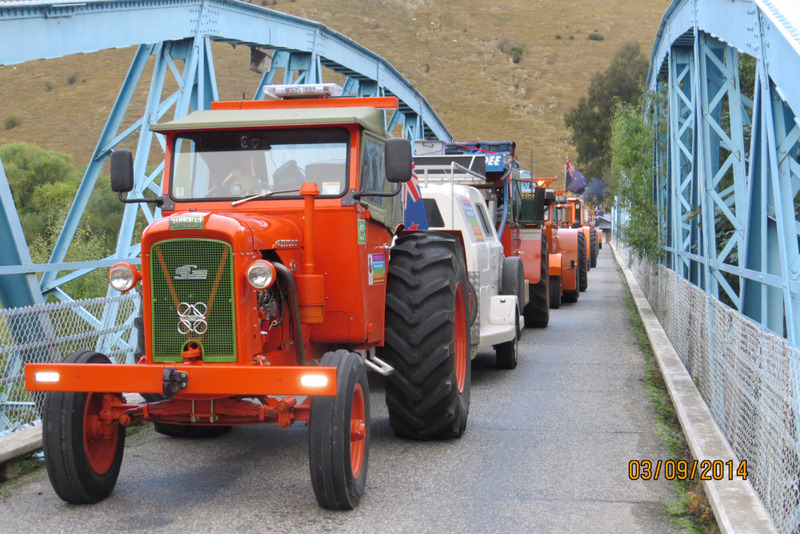 The early birds made good time through the station and arrived into Blenheim by 4.00pm, while the stragglers camped overnight at the Hodder Bridge with great views across the river bed, arriving into Blenheim around 11.00am. 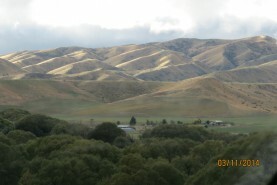 The Molesworth Station covers an enormous tract of land, very mountainous with the river never far away from the narrow winding track. Magnificent views can be seen around every corner. Along the way, the Acheron Accommodation house (from 1862) and the Molesworth Cob Cottage have been maintained in pretty good condition and made for interesting viewing. 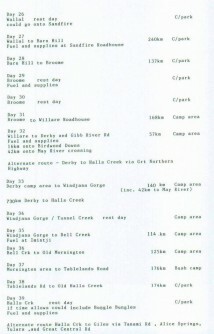 Day 4: February 22. 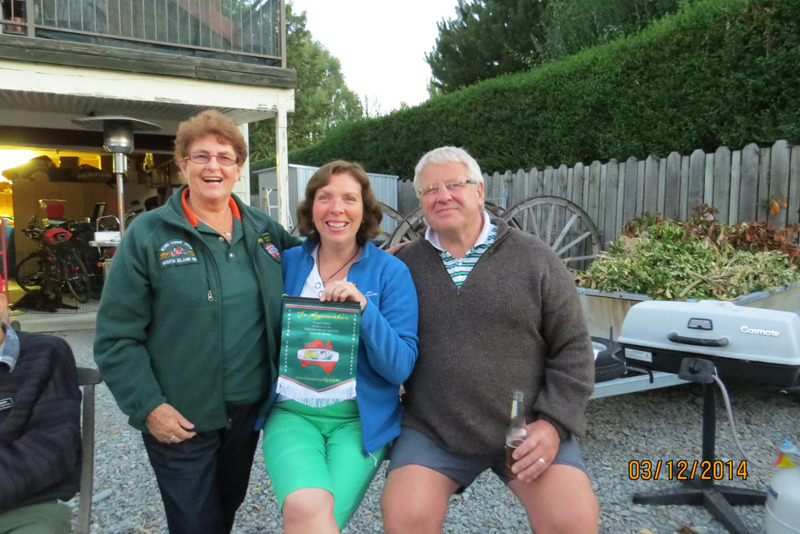 This was a designated ‘rest day’ and a chance to catch up after the long drive the previous day. 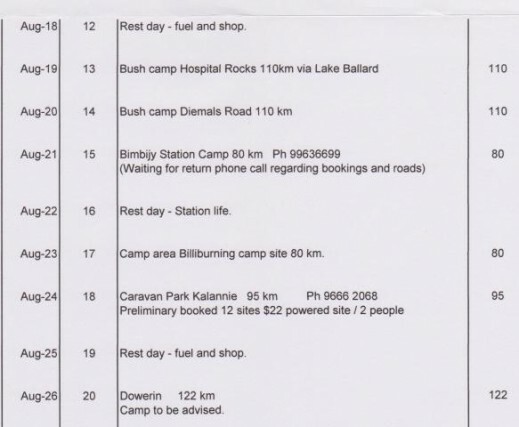 Day 5: February 23. 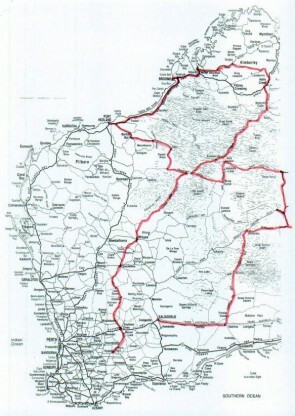 Blenheim to Havelock. 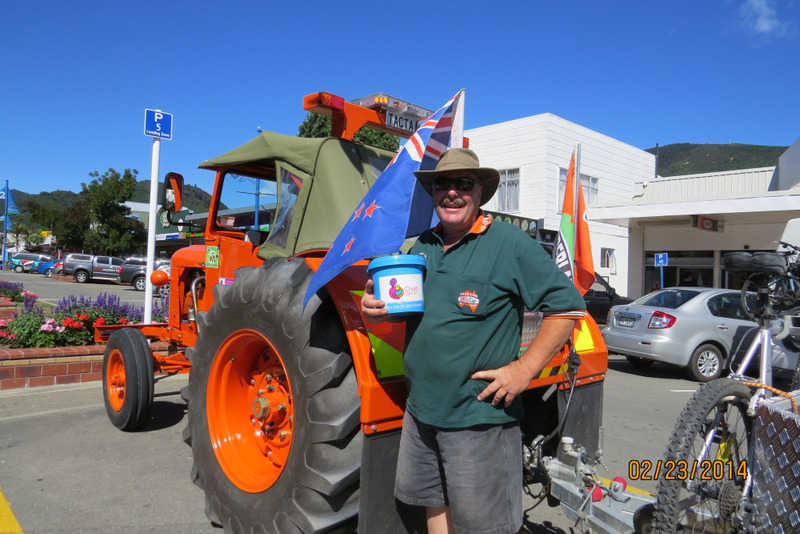 The trek wound its way into Picton mid morning and enjoyed good response to enthusiastic ‘bucket shaking’ from the locals. 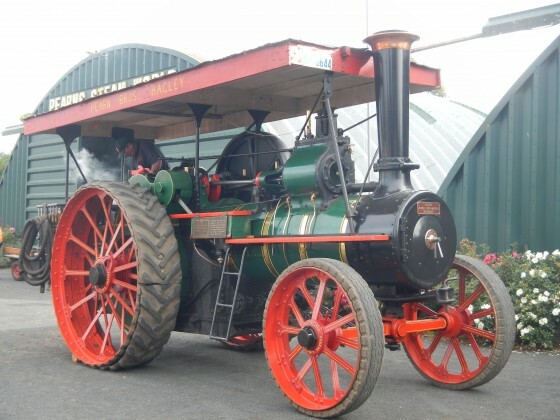 We have a star ‘shaker’ in Steve, who was able to relieve most people of some of their loose change in the main street, with his beautifully restored 9G as the main attraction. 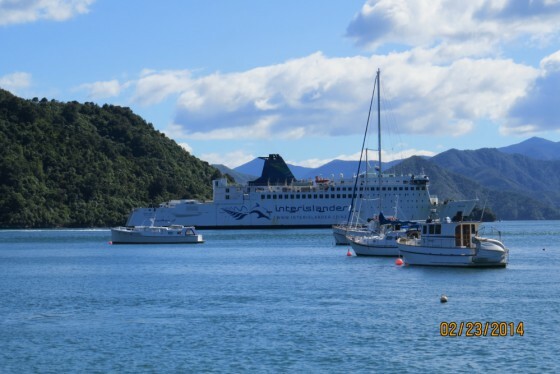 The Marlborough Sounds provide such a fantastic vista and watching the ferries come into the Picton Harbour was an added bonus. The day being perfect for sight-seeing, it was a great experience to take the winding road from Picton to Havelock, via some very pretty little bays. 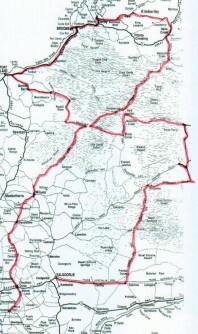 Day 6: February 24. Havelock to Nelson. 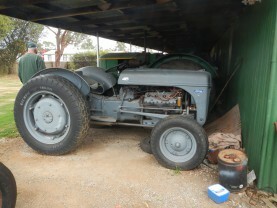 The old moral ‘that if you want something done properly, do it yourself’ became evident yesterday when a new motor, assembled in one of our tractors by ‘professionals’ developed a serious internal condition. The tractor in question had to be retired from the Trek but the owners continued the trek adventure travelling with other members of the group. Despite this setback, many of the group enjoyed the local mussels at Havelock – a real delicacy. 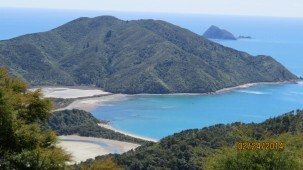 From Havelock it was an easy run around the mountains, before the decision was made to deviate from Delorus Bridge to Okiwi Bay, another very beautiful expanse of water flowing into the Croisilles Harbour. Along the way the hillsides are covered with pine trees and pastures being enjoyed by very healthy farm animals. 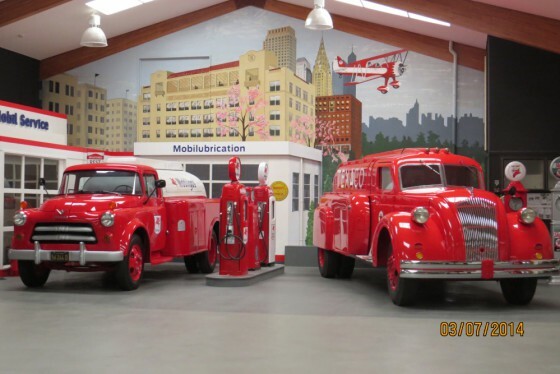 After enjoying the lunch break at Okiwi, we all headed to Nelson where the trekkers enjoyed a visit to the WOW Classic Car Museum before heading to the overnight camp. 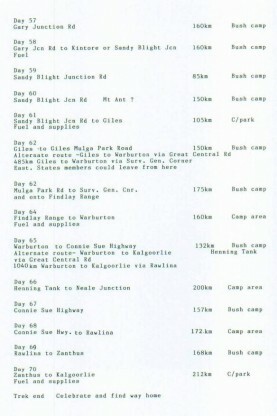 Day 7: February 25. 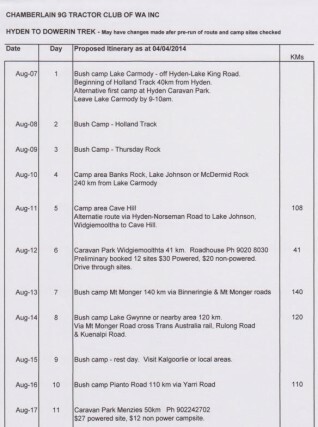 Nelson to Murchison. The press came to film the crew and the trators leaving the Kiwi Park at Nelson on another bright sunny day, before we headed to Wakefield for a special morning tea organized at Higgins Park. Most of the tractors managed to miss the turn-off and it looked like a lot of morning tea for not many people, but eventually everyone turned up for a delicious range of home-baked goodies. 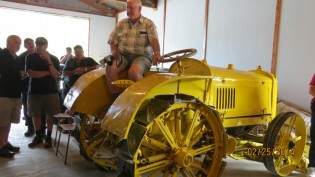 The members of the Nelson Vintage Engine and Machinery Club loved showing us their special tractors and trucks including a 1917 Ruggles & Parsons tractor, one of only three known to have survived after being shipped from America to this area and used for farming in the local district for many years. 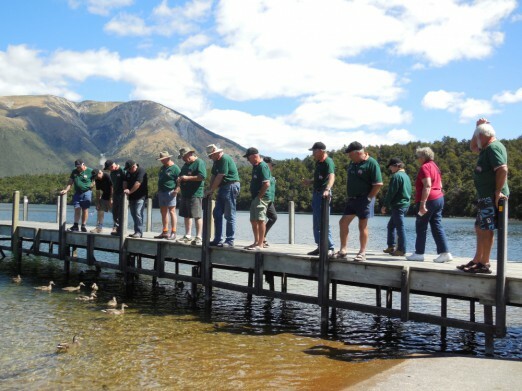 A detour to Lake Rotoiti was a very pleasant stopover – a lovely lake and mountains with eels and ducks in plentiful supply. Then it was time for the run into Murchison through the pine plantation country, again very picturesque, for our stop-over at the Kiwi Park. 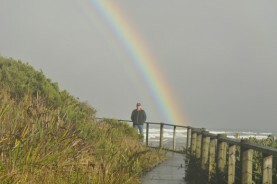 Day 8: February 26. 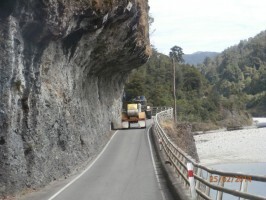 Murchison to Greymouth. This morning we had to bid a sad farewell to three of our New Zealand friends and their tractors – Bruce, Graeme and Geoff. These members of our trek had to return to their respective working lives, but will catch up with us again at Methven at the end of our trek. 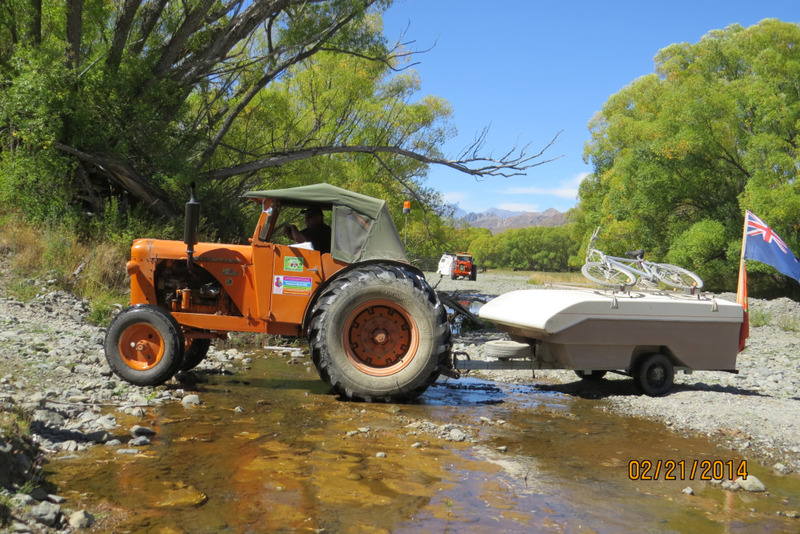 With the remaining 11 tractors, we headed south to Westport through the Buller Gorge with the river always close by. 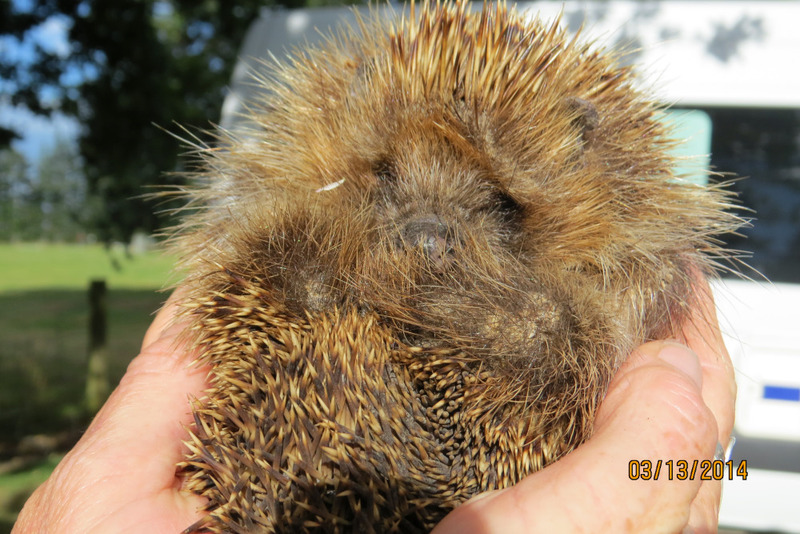 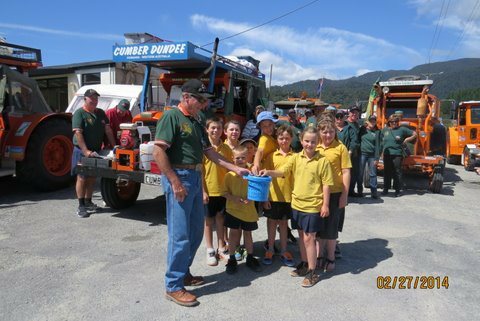 Thanks to the generosity of the people we met along the way, we had collected quite a healthy sum from donations and this was an opportunity to bank these funds to add to the total raised. 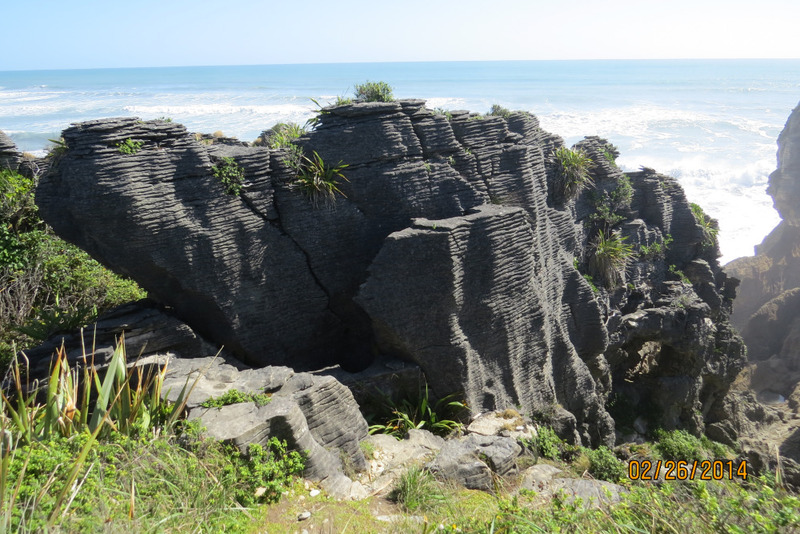 After lunch at Westport, the tractors backtracked to Highway 6 for the run down to the coast to visit the fantastic Pancake Rocks at Punakaiki, a truly memorable experience. 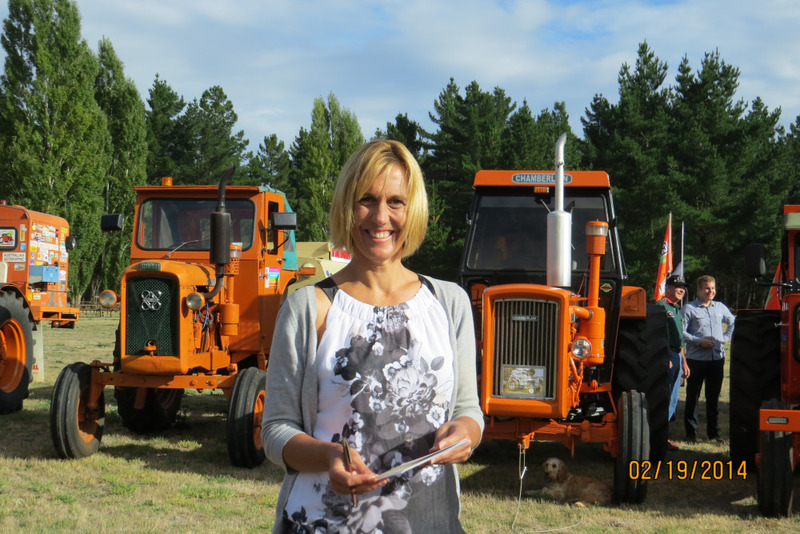 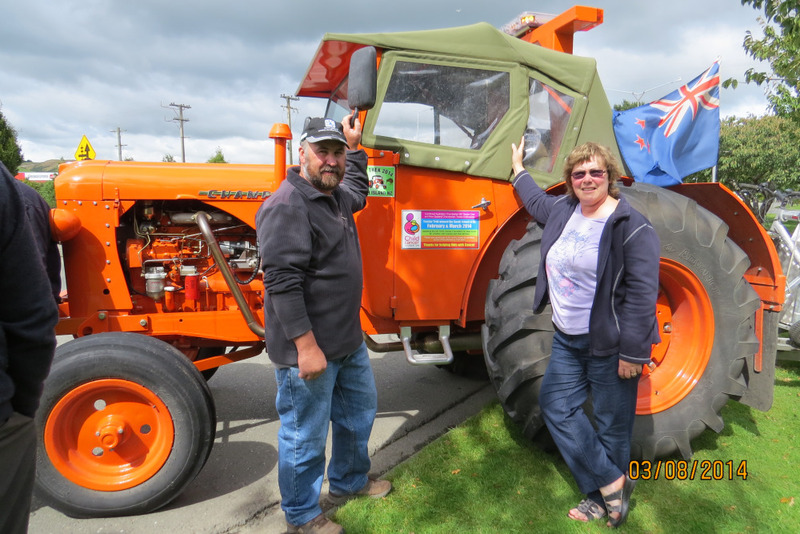 All tractors and supports were available at the Kiwi Park in Greymouth to meet with a local lady, Margaret Woollett, who had arranged for us to meet two young people, Tasja and Flynn from the area who have suffered from cancers and are currently doing well. This was an opportunity to have a one on one connection with the people who are helped by the Child Cancer Foundation of New Zealand. 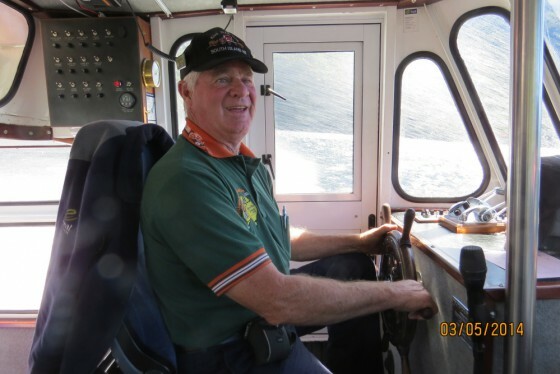 Day 9: February 27 – Greymouth to Franz Josef. 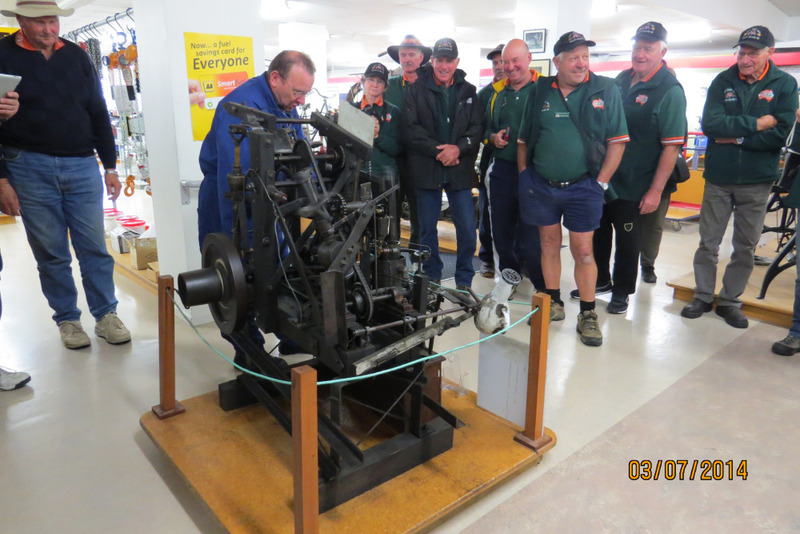 After the normal morning get-together, we all headed to Hokitika for shopping, then on to visit the sock museum and factory – it was amazing to see a sock come off a fully automated machine. 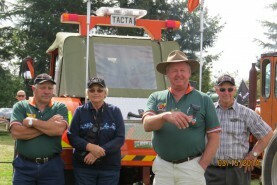 Next we visited the Westland Industrial Heritage Park where the enthusiastic club members have restored a great variety of machines of different types – from a huge engine capable of running a whole saw mill to a beautifully restored fire engine and even a carriage capable of carrying several people with four horses pulling it. 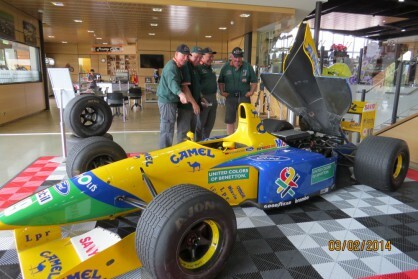 At any one time, their team has five different restorations in progress. 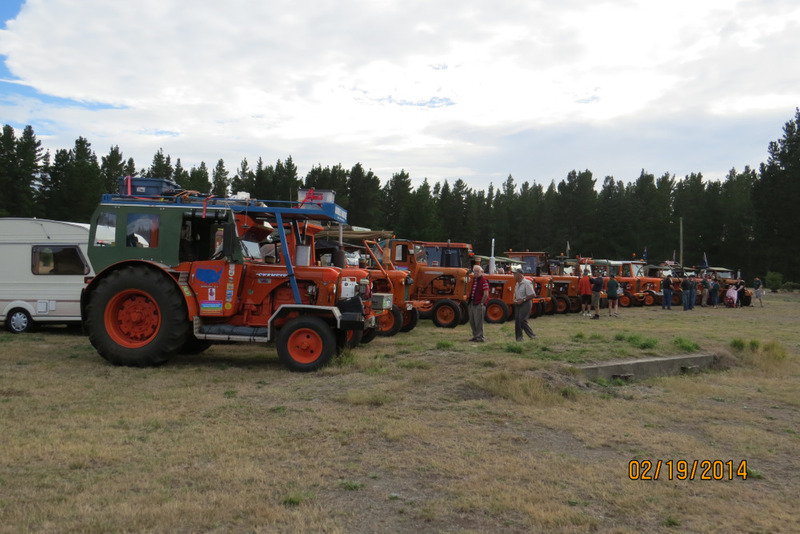 The lunch stop was at the small town of Ross where the local primary school children came to visit and were most enthusiastic about climbing into and admiring the ‘fantastic orange tractors’. 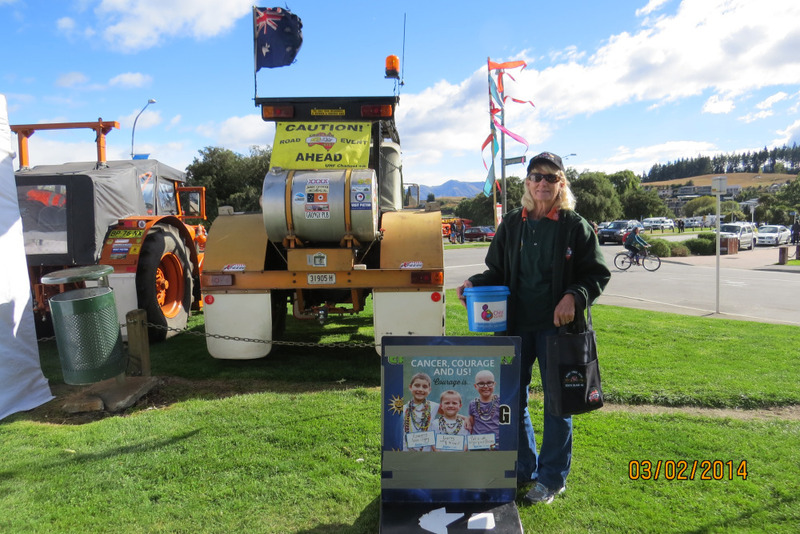 The children contributed to our cause with a ceremonial placing of coins into one of our blue collection buckets. 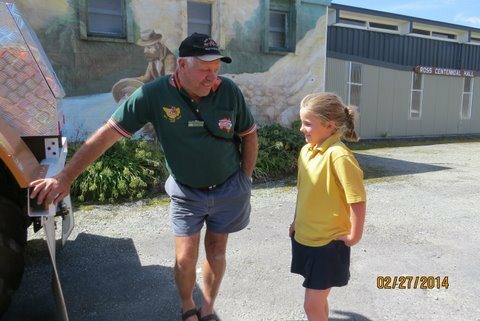 By then it was time for the run to Franz Joseph where we enjoyed a visit to the West Coast Wildlife Centre, home of the Rowi, New Zealand’s rarest kiwi. 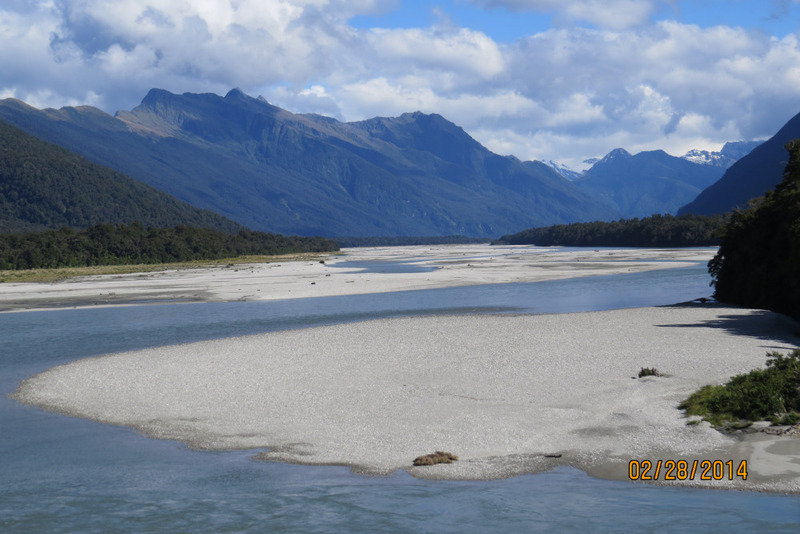 Day 10: February 28 – Franz Josef to Haast. 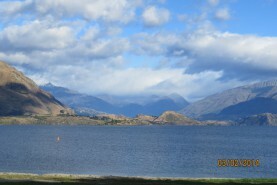 The forecast showers came overnight and we all awoke to a rather damp looking day, but could not complain after such beautiful weather all along the way. Being in glacier country, it was time to have a look at these natural wonders. 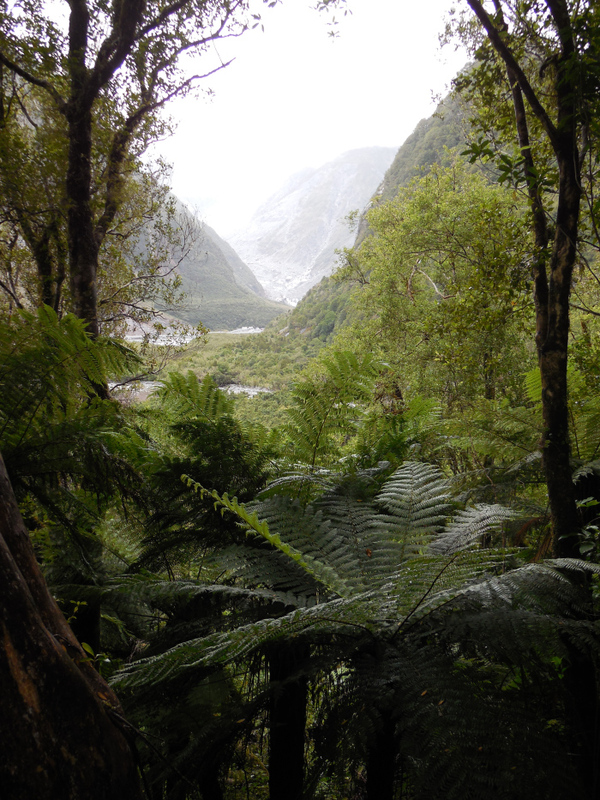 Despite the overcast conditions, the scenery was still spectacular and enjoyed by all members of the group. 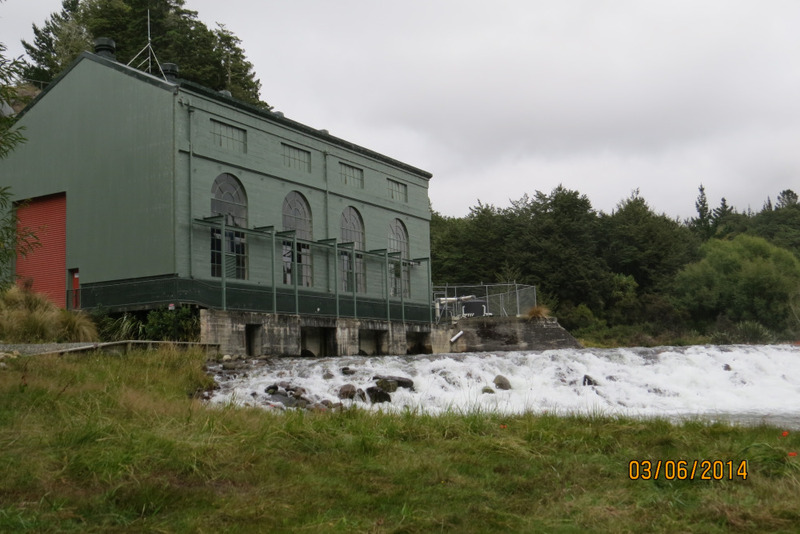 The lunch stop was at the Salmon Farm, then the trekkers made the most of the improved weather conditions to have a good look around the area, including short detours to many of the very photographic bays. 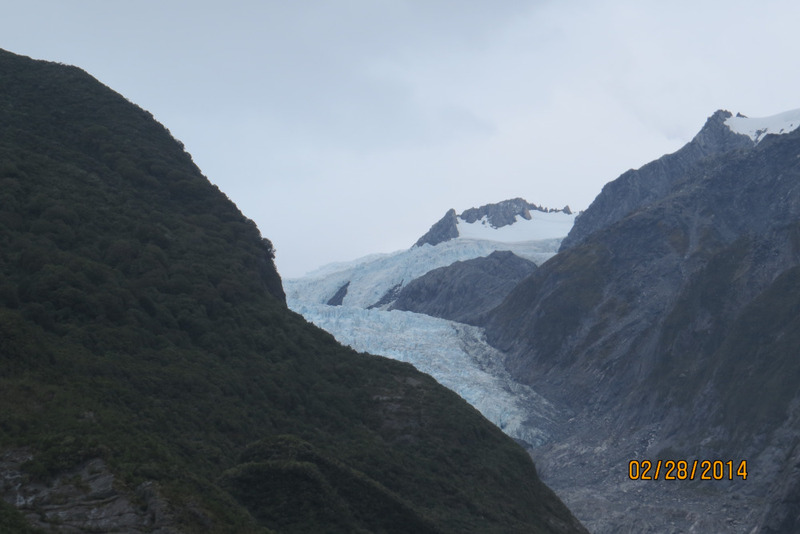 Day 11: March 1 – Franz Josef to Wanaka. This was to be a day of sightseeing with picture perfect views everywhere one looked. Each waterfall has its own character and the walks to and from these attractions are through lovely dense rain-forest. The main attraction of the day was the Blue Pools on Highway 6 heading into Wanaka, before the run around the lakes into the town which was absolutely spectacular. 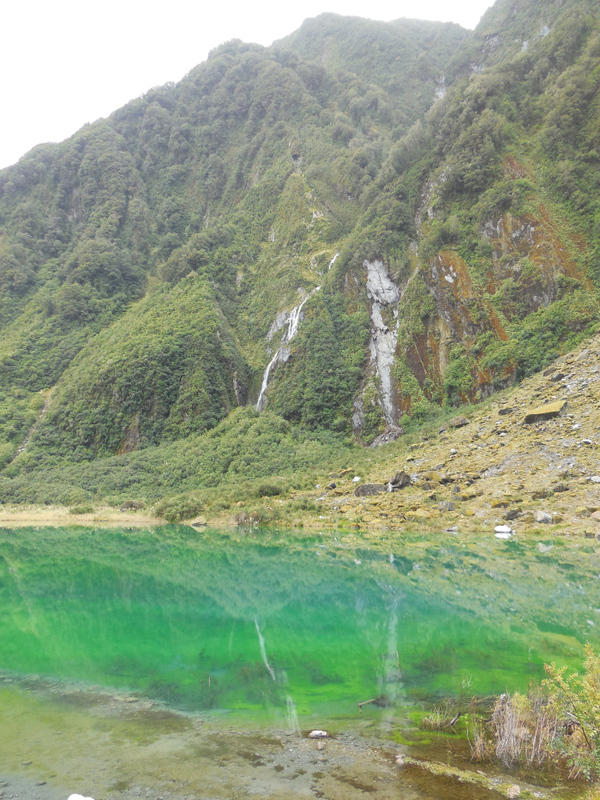 Aren’t we lucky to have our digital cameras these days – we are ‘snap-happy trekkers’! 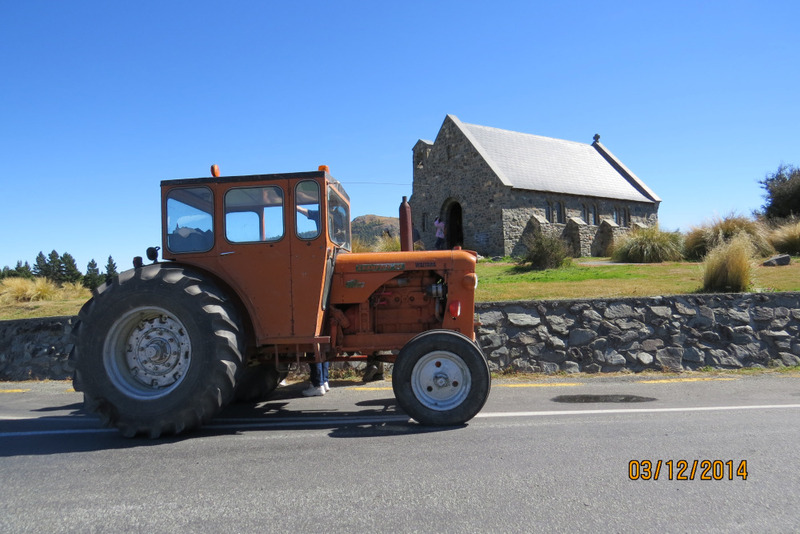 Day 12: March 2 – Wanaka to Cromwell. 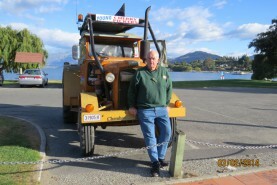 The group had a couple of hours to spend in Wanaka before heading off, and this proved to be a busy time. 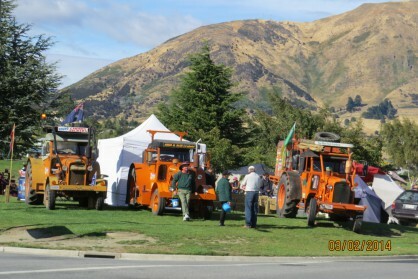 There was a market-place down close to the waterfront, and three tractors managed to park among the stall-holders and take turns in rattling tins, with very successful results. Then it was off through the countryside to the old pub at Cardrona – a wonderful old building of stone with a picturesque façade which looks as though it came out of a different time in history. 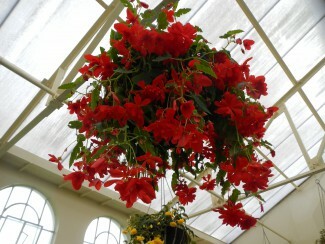 The internal fittings of the hotel are also of antique style and the rose gardens really delightful. The run down the zig-zag road was interesting, but needed lots of concentration from the drivers. 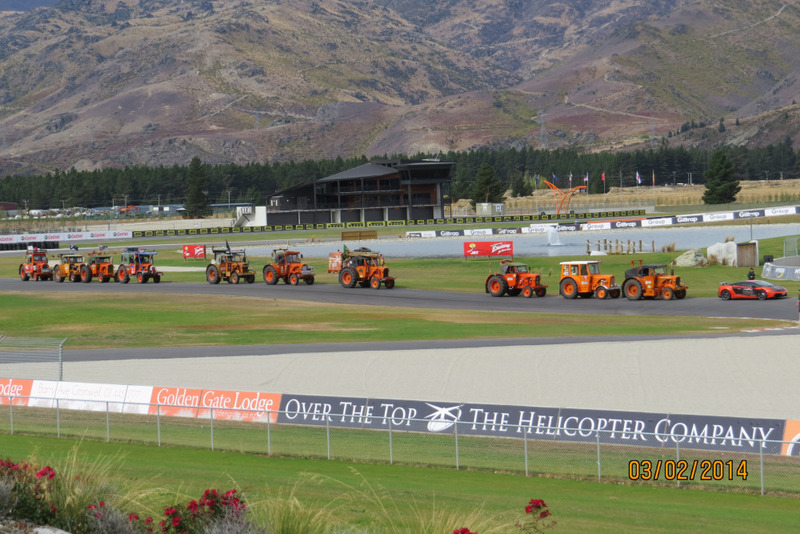 The lunch stop in Arrowtown was a pleasant break, then it was off to the Highlands Motorsport Park for a spin around the almost new race track, a real bonus for the tractor drivers arranged by Steve Day. 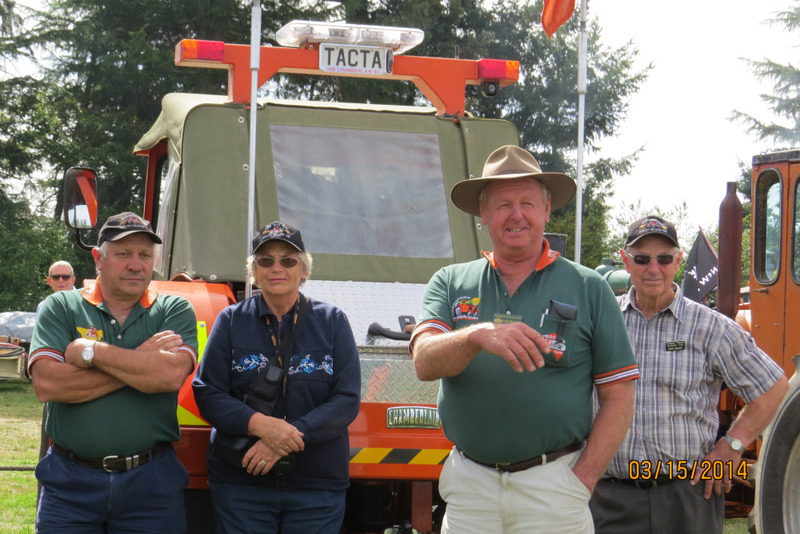 We just had time to book into the Cromwell Top 10 Park before an arranged visit to the local Heritage Club for a meet and greet, and an opportunity to thank Roger Mahan personally for his donation of special caps. Day 13: March 3 – Cromwell to Kingston. The Nevis Track Experience! 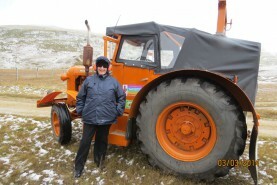 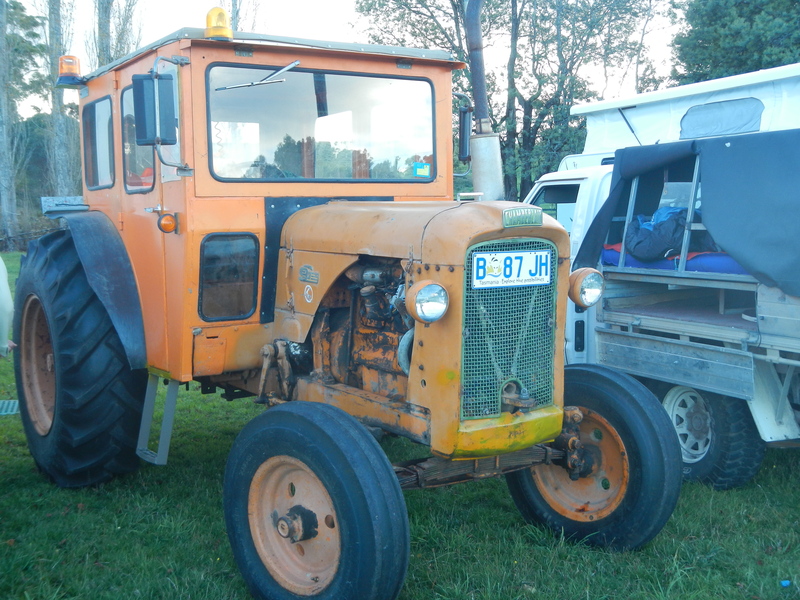 Everyone knows that the Chamberlain 9G Tractor is a real work-horse and that Club trekkers are real adventurers, but no-one expected the day we experienced. The convoy set off in lovely conditions to drive the Nevis Track out of Cromwell after a quick look at the old Cromwell township. As we ascended the mountains the views downhill were always changing but ever beautiful. 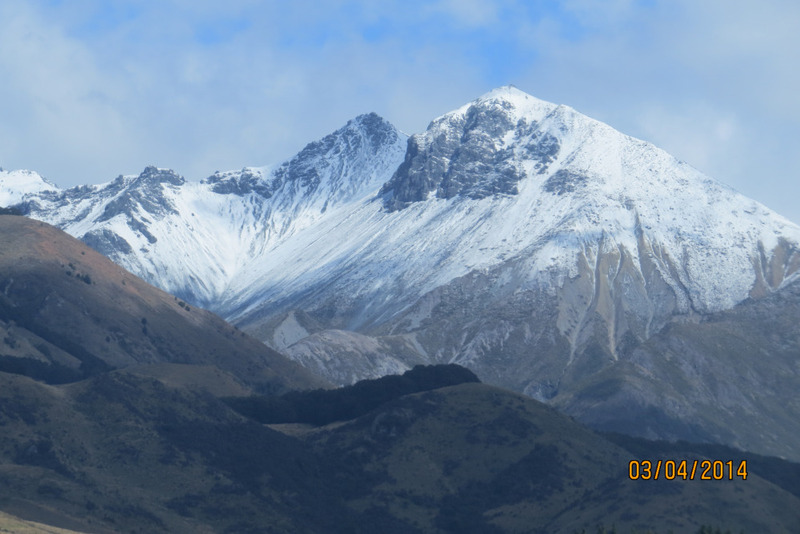 Then we had a light sprinkling of snow and the whole area turned into a fairyland. 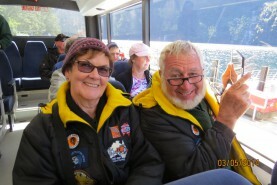 The track was good and we were all buoyant when we stopped for lunch, just so happy to have experienced such beauty. 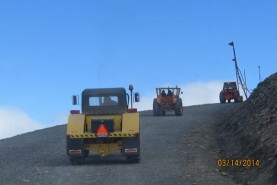 Unfortunately the track deteriorated after lunch and so did the weather, with a severe snow storm coming in, reducing the vision considerably. 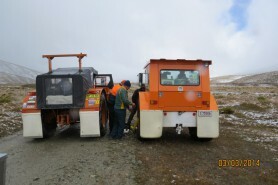 Paul’s tractor took the opportunity to have a flat tyre which needed pumping up regularly along the way – lucky these trekkers are well prepared for such emergencies. 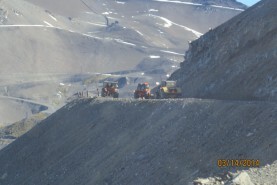 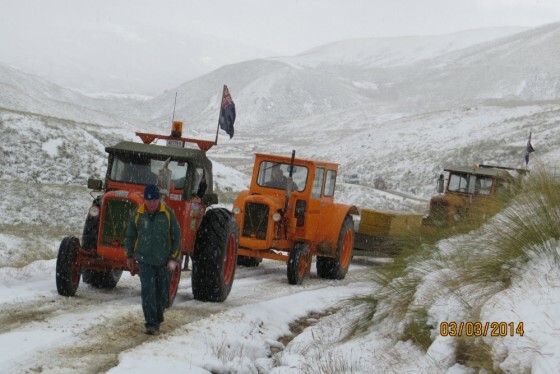 By the time the first tractors came down off the mountain, it was extremely cold and miserable and it was some time before the other tractors arrived, having left three support vehicles on the mountain, it being just too dangerous to attempt to bring them down in the slippery conditions. A good dinner at the Kingston restaurant was an opportunity to swap tales of experiencing a snow storm on the Nevis Track. 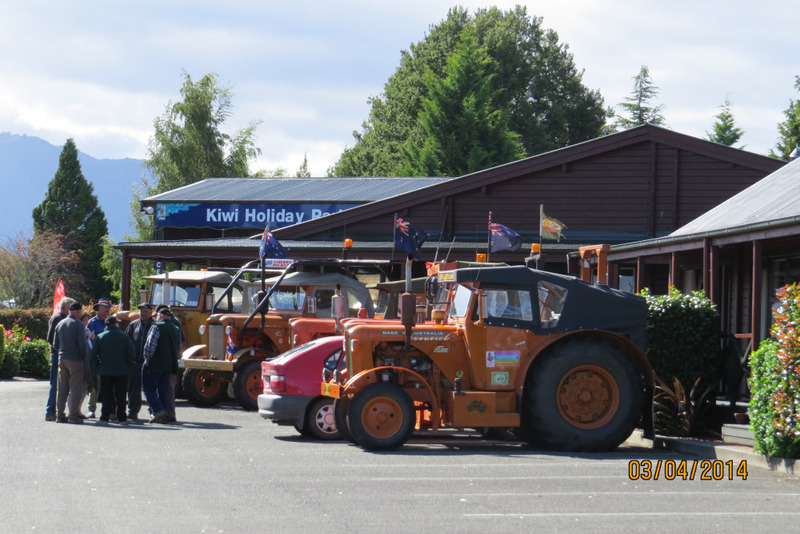 Day 14: March 4 – Kingston to Te Anau. 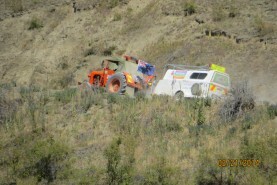 First priority of the day was to retrieve the three vehicles still on the mountain – two RVs and the Bass’s caravan. 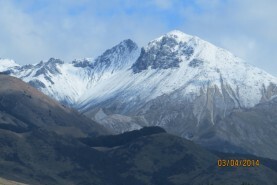 This was achieved without further difficulty and the trekkers spent a relatively quiet day after all the dramas yesterday. 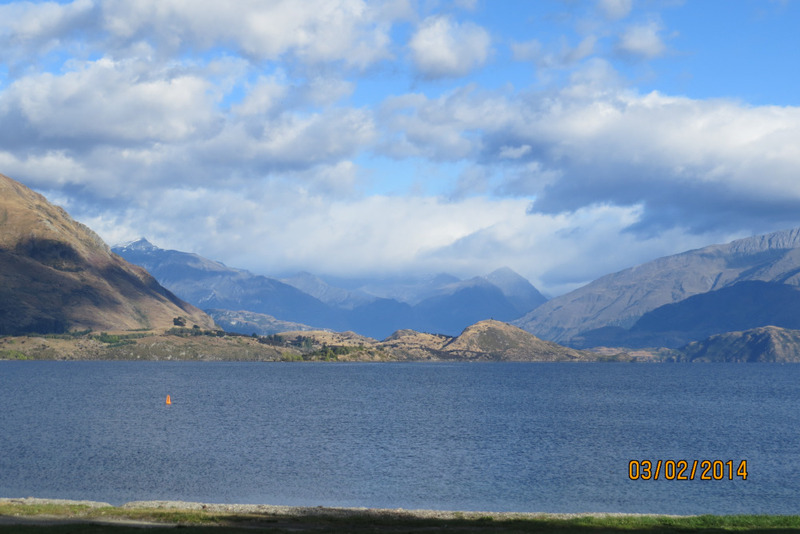 The drive to Te Anau was through lovely snowcaps and farmlands, before booking in at the Kiwi Park and busy booking tickets for a visit to Doubtful Sound the following day. 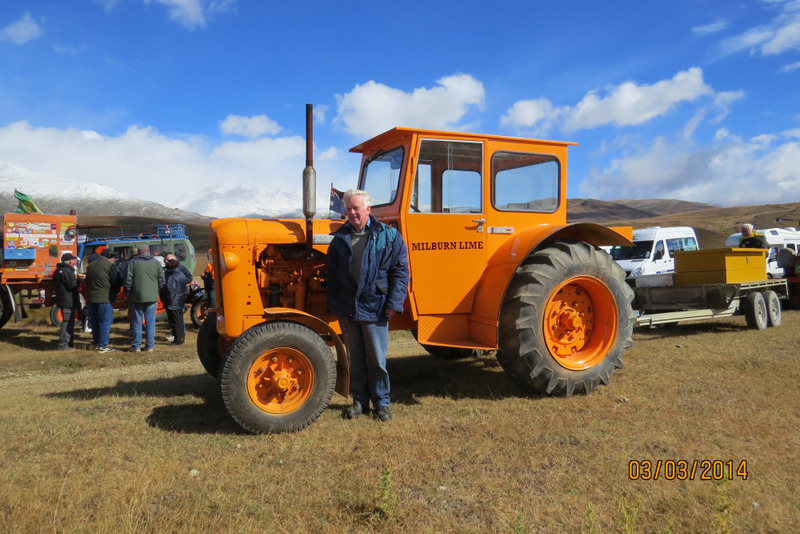 In the late afternoon, the group was invited to the Fiordland Vintage Machinery Museum where their President, Brian Risk, arranged a dinner for us of freshly hunted venison which was quite delicious. 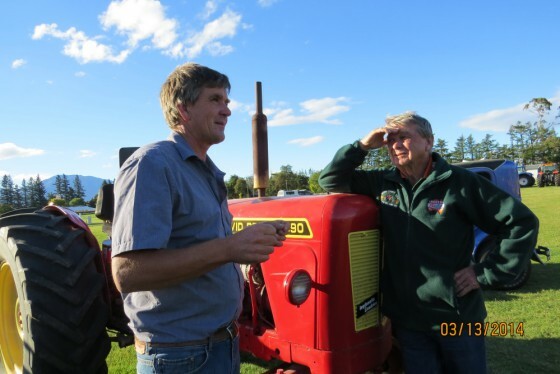 This was a really enjoyable visit with the members of their club and an opportunity to see their collection of well restored farm tractors, machinery and numerous items of past era common day implements. Day 16: March 6 – Te Anau to Tuatapere. 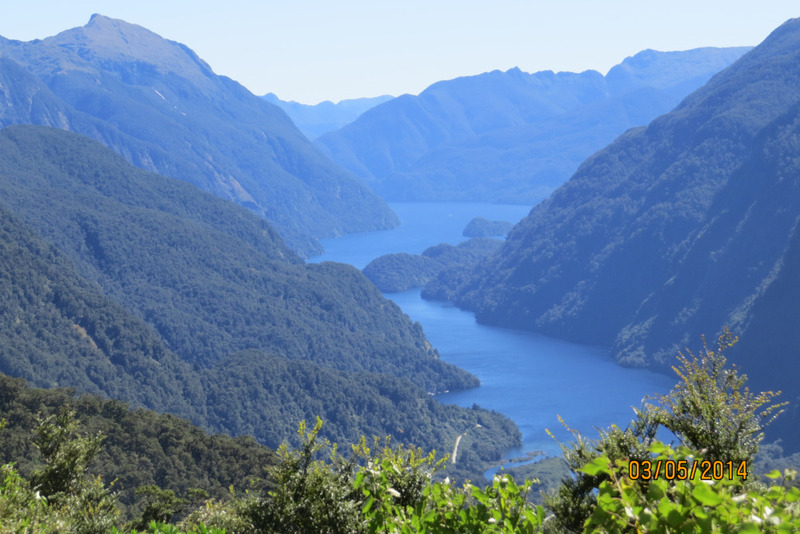 The weather could not have been more different to the previous day when we had headed to Doubtful Sound under clearing blue skies. 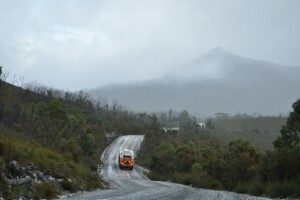 By comparison, this morning was shrouded in mist until around 9.30am, and remained overcast for the rest of the day. 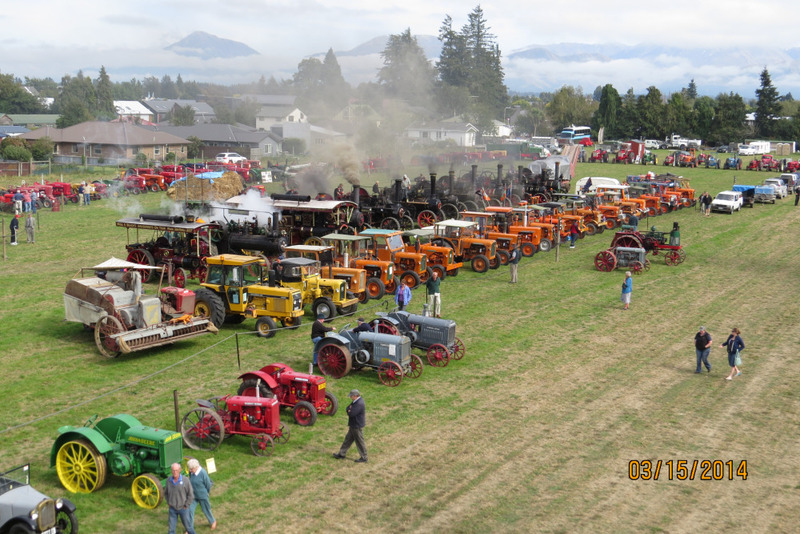 Not too many plans had been made for the day, a sure way of having lots of extras added! 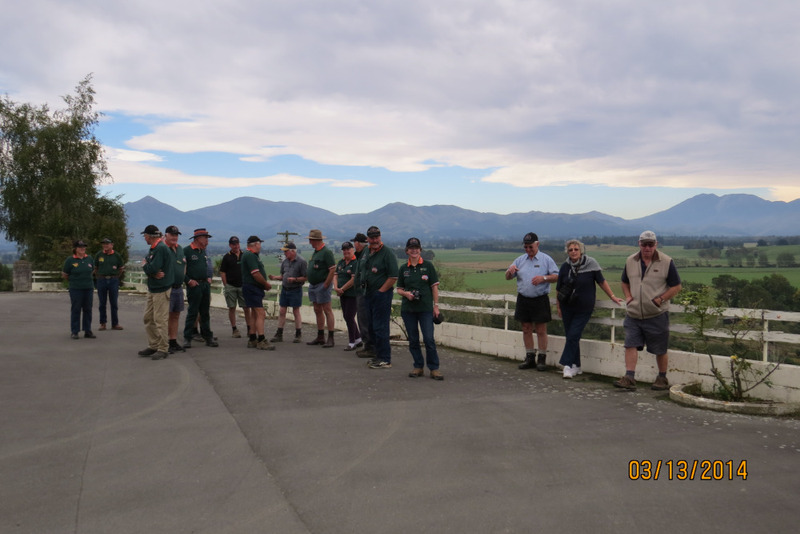 The first planned activity was a morning tea stop at the Monowai Power Station where the group was given a very interesting insight into the history and running of this facility. 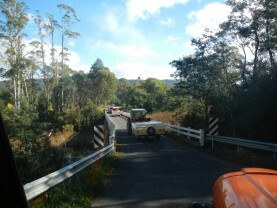 By lunch time, we had arrived at the Clifden Bridge, now closed to traffic but well worth stopping to see. 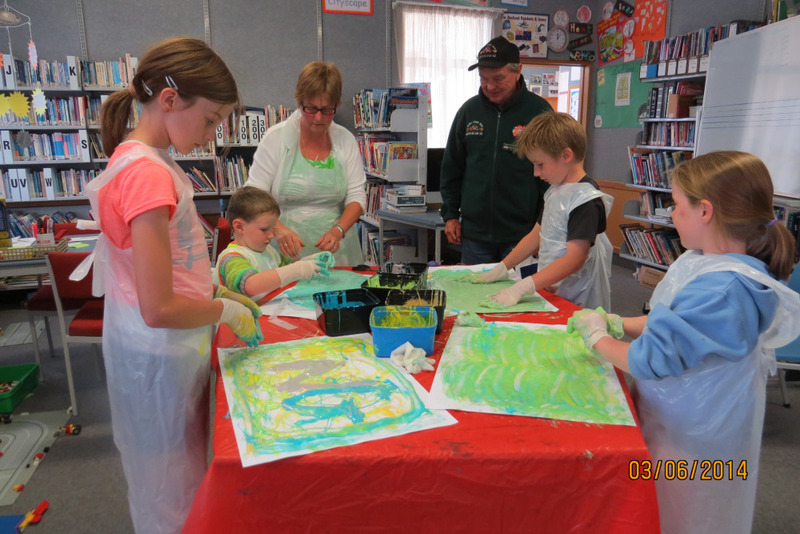 Just up the road from the bridge was the Blackmount School where we were lucky enough to see a group of children making patterns with PVC glue and soapflakes – looked like good fun. 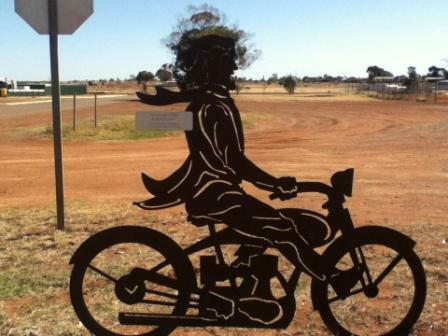 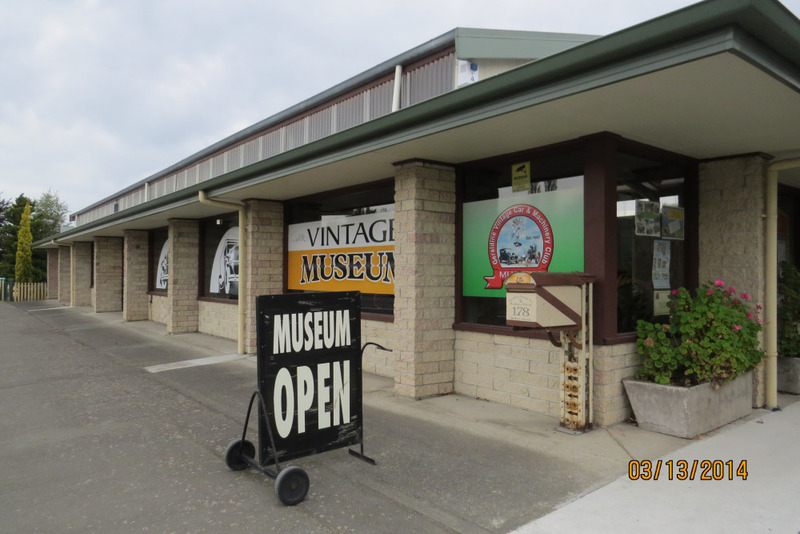 Because there was not a long drive to the overnight stop, it was suggested that we take a detour out to near Winton to see the Church of the Dolls – an amazing collection of beautifully dressed dolls and doll houses. 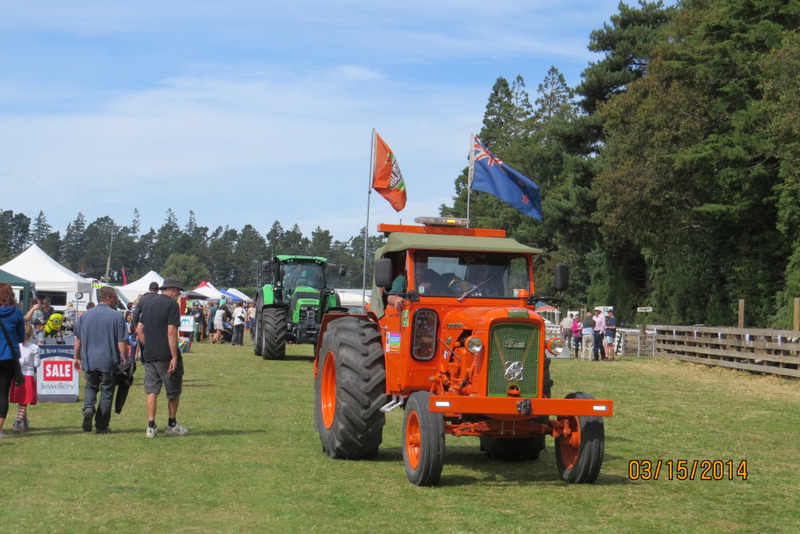 The ladies could not have all the fun, so the next stop was to see a beautifully restored collection of many models of tractors! 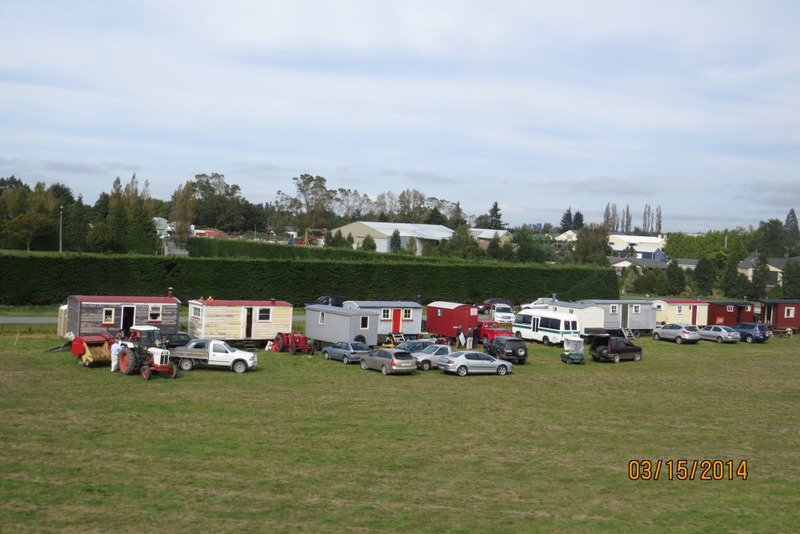 The Lions Club of Tuatapere had offered to put on a BBQ dinner for our group, so we all headed to a large shed where a great spread was laid out for our enjoyment and to help in our fund-raising efforts. 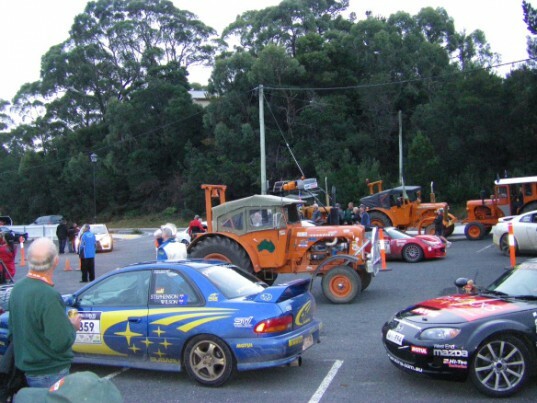 This was a most enjoyable evening. Day 17 : March 7th – Tuatepere to Invercargill. 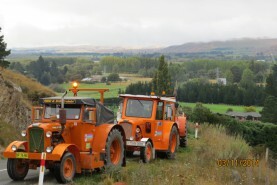 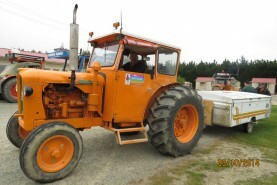 The trekkers departed Tuatapere under cloudy skies – some members took a quick look at stops along the coast and three tractors called in to the Riverton Childcare and the Riverton Primary School where the children were just so excited to see the big orange machines and many vied for turns to hop in for a closer look. 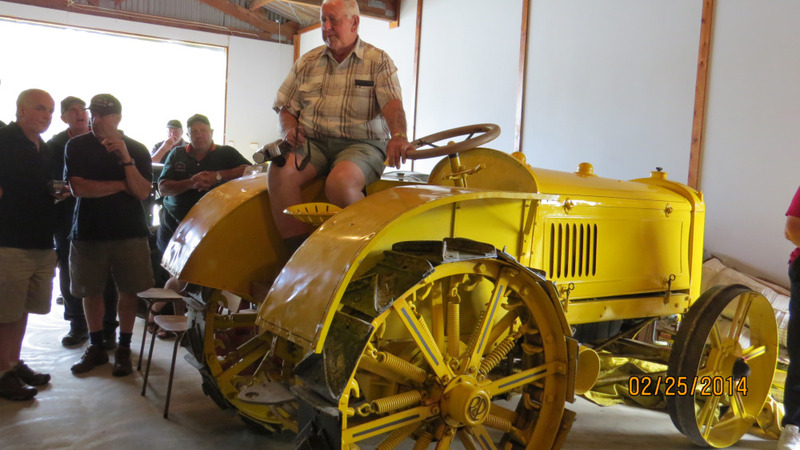 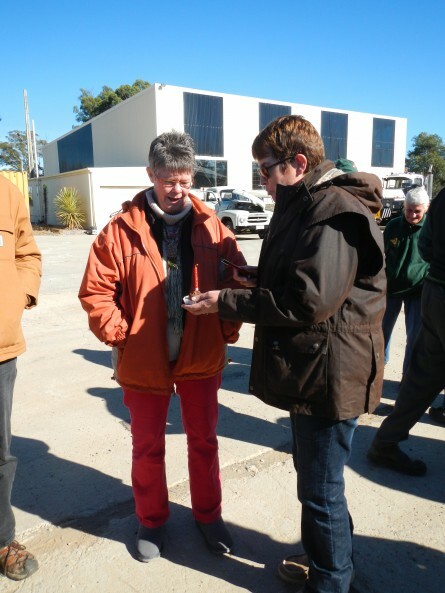 A wonderful morning tea was enjoyed at the heritage machinery group’s facilities in Thornbury, before heading to Bluff, the most southerly point of the New Zealand mainland. 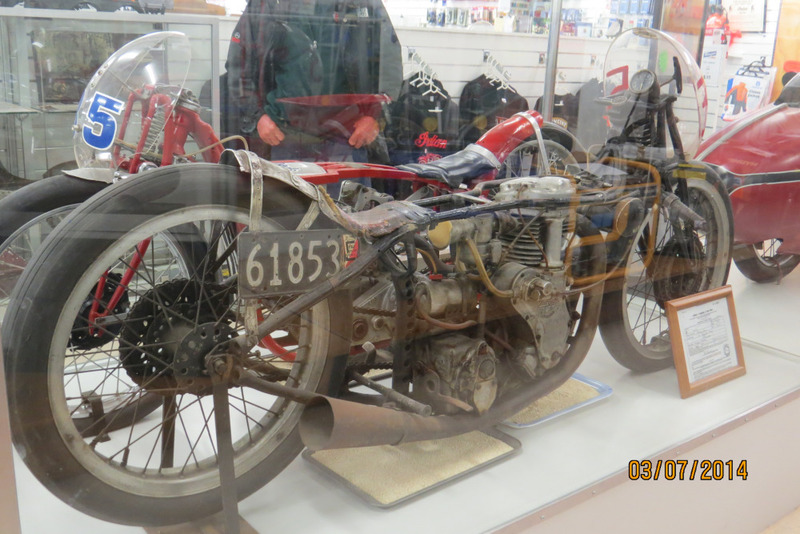 The ‘boys’ of the group had been anxiously awaiting the opportunity to visit Hayes Hardware store in Invercargill to see the ‘Fastest Indian’, the motor-bike made famous by H J (Burt) Munro when he broke many land speed records on it in NZ and at the Bonneville Salt Flats in the USA, and this was a really top place to visit, with all sorts of interesting machines, one made from scrap materials which actually runs and we were able to see it chugging out a small amount of smoke – too much would set off the fire alarms! Still on the old conveyance trail, we visited Richardson’s Truck Museum – a fantastic array of beautifully restored trucks, old signs and the occasional old petrol pump – a great place to visit. 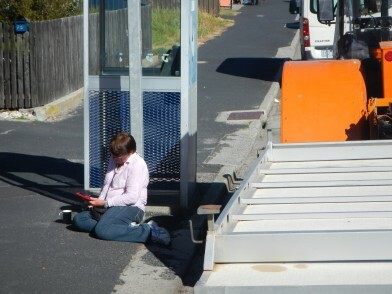 This had been a day of contrasts with something for everyone. At Bluff Point – southern most point N.Z. 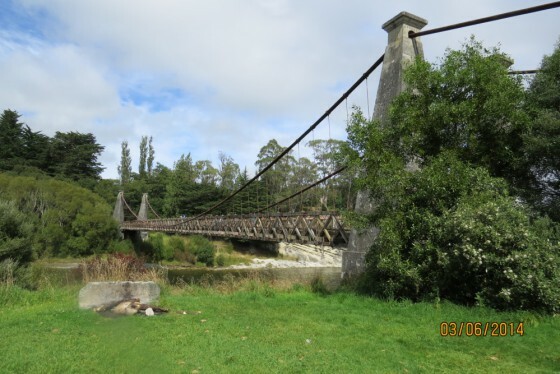 Day 18: March 8th – Invercargill to Millers Flat. It was time to say farewell to our newest Club members, Helmut and Noi, who had joined us as part of their holiday in NZ from Thailand. 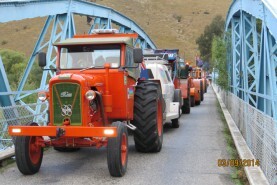 The tractors headed down to Oreti Beach, very close to our overnight campsite, for a photo opportunity. This is a recognized road and quite safe for travel at low tide. 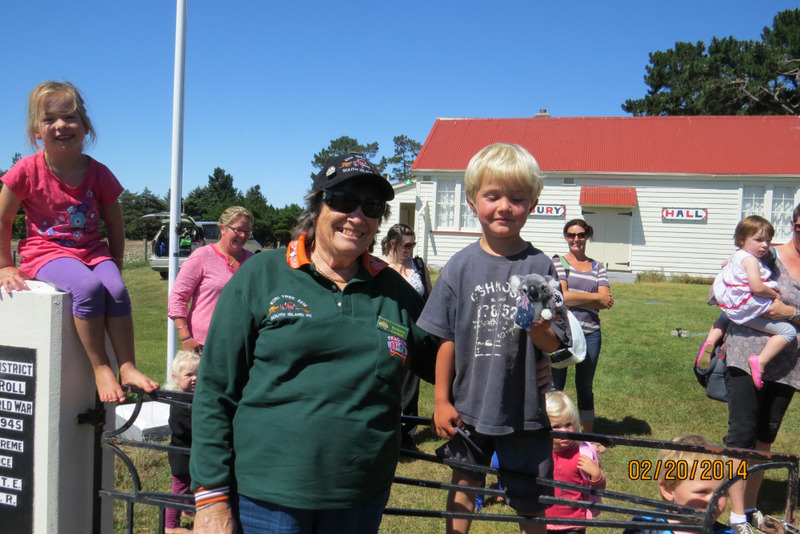 Lucky for all of us, our kind hosts at the Beach Road Holiday Park at Otatara, Gerry and Sharon, presented us with enough freshly baked chocolate muffins to give each person a treat for morning tea when we stopped at Edendale. 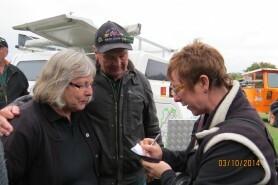 We had arranged to meet Karen, the representative of the Child Cancer Foundation, at Gore which became our lunch stop and an opportunity for members to rattle their buckets in the streets. 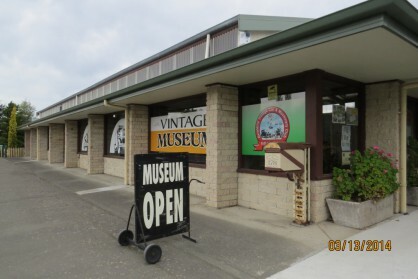 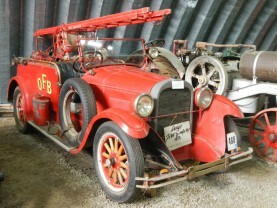 Next on the agenda was a visit to the West Otago Heritage Museum, kindly arranged by Roger Mahan. 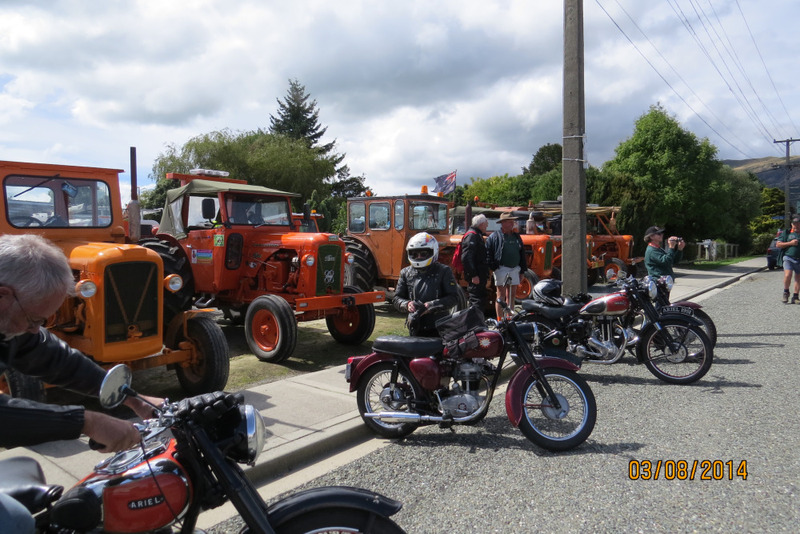 The main street of town became a maze of tractors and motorbikes – a club celebrating their 40th Anniversary we were told. 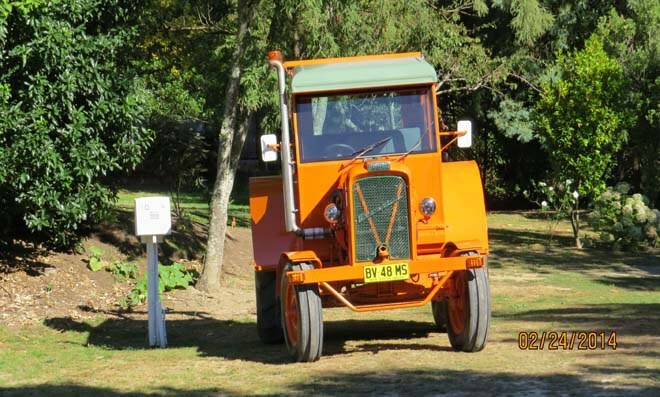 Once they had moved on, it was our chance to see the Museum’s fine collection of very old tractors and memorabilia and to partake in an enjoyable afternoon tea. 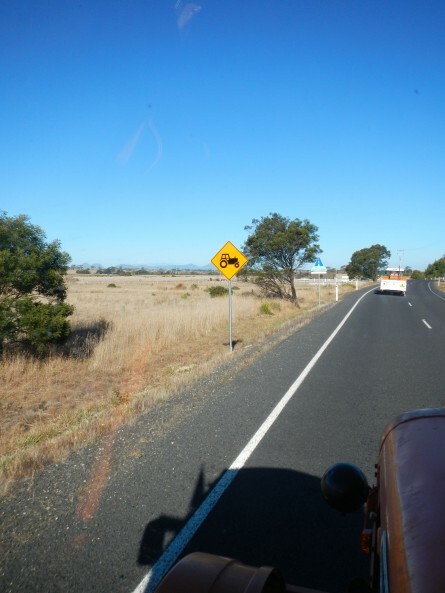 Once back on the road, the countryside became even more beautiful, with the Blue Mountains and the ever green, rolling hills. 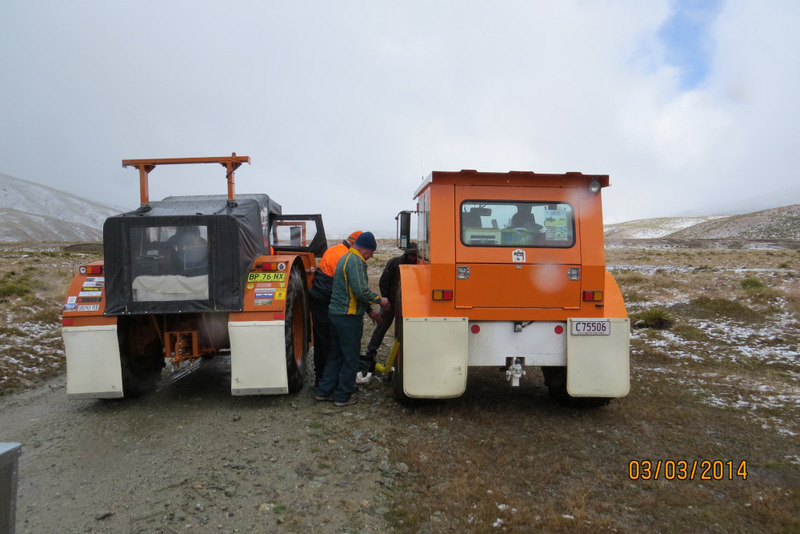 Day 19: March 9th – Millers Flat to Ranfurly. 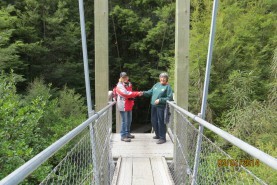 First stop of the day was a photo-shoot on the very unusual bridge at Millers Flat. 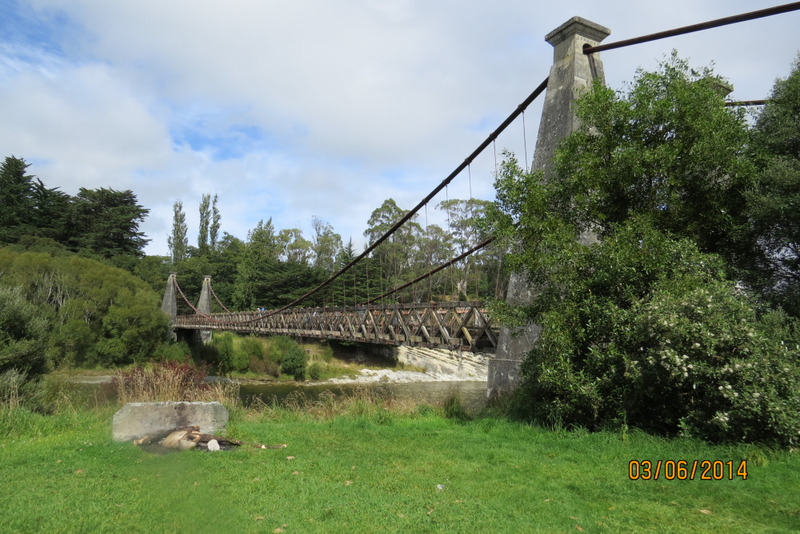 Then it was a leisurely amble along to Roxburgh where the group pretty much took over the town on a quiet Sunday morning, all keen to sample the famous ‘Jimmy’s Pies’ we had been told about. 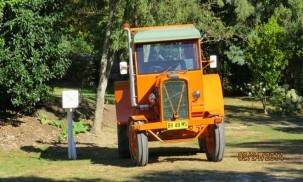 The factory was closed, but the tearooms had good stocks and they did not disappoint! The track up and over the mountains was just spectacular and never threatened the vehicles or drivers. Only one ford had to be crossed on the way to Lake Onslow Hydro Dam. This is very hilly country with quite unusually shaped gullies. 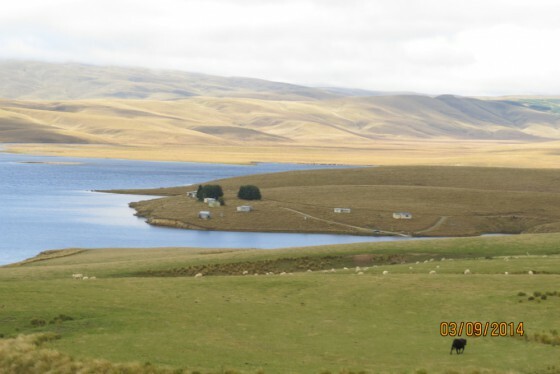 The sheep and cattle climb up the high mountains with no evident problem, while the farmed deer are seen more on the river flats. 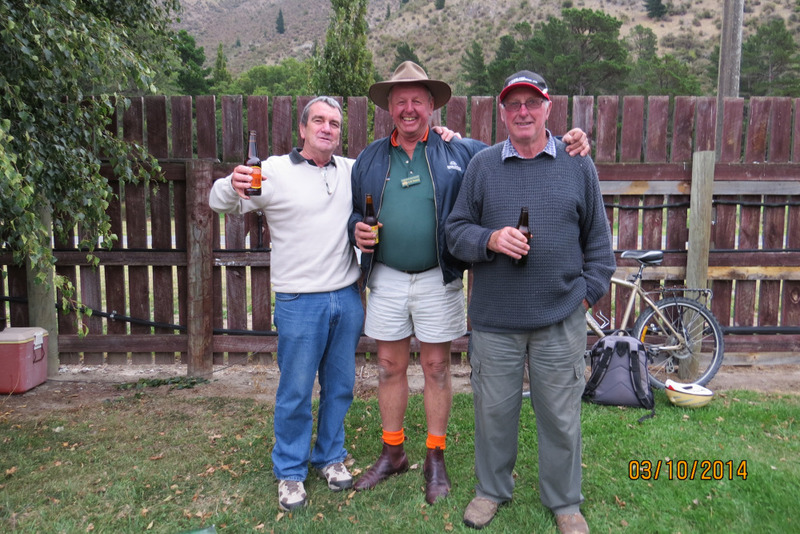 All the team members were into Ranfurly by 3.00pm for an early relaxing afternoon. 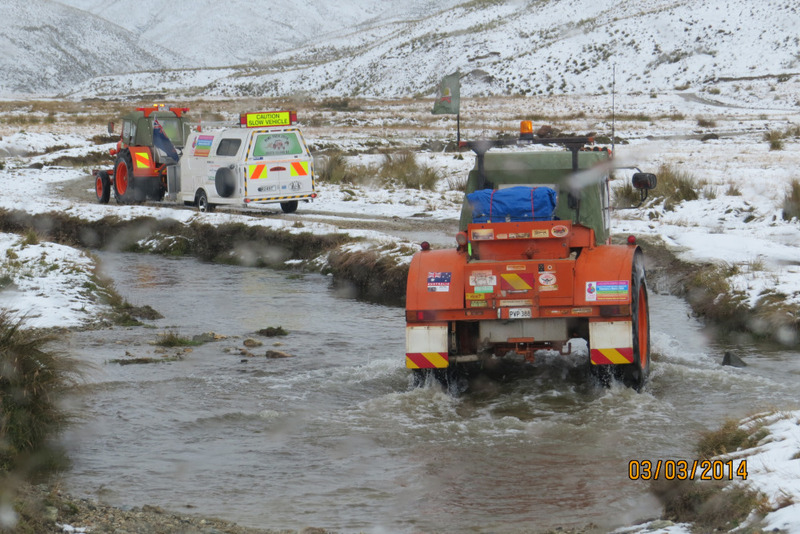 Day 20: March 10th – Ranfurly to Kurow. The group headed up to Dansey Pass after morning tea at Naseby. 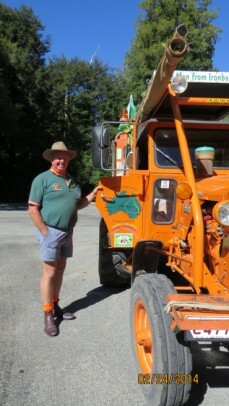 Our New Zealand enthusiast Ray headed for home from Dansey after spending some days with us. 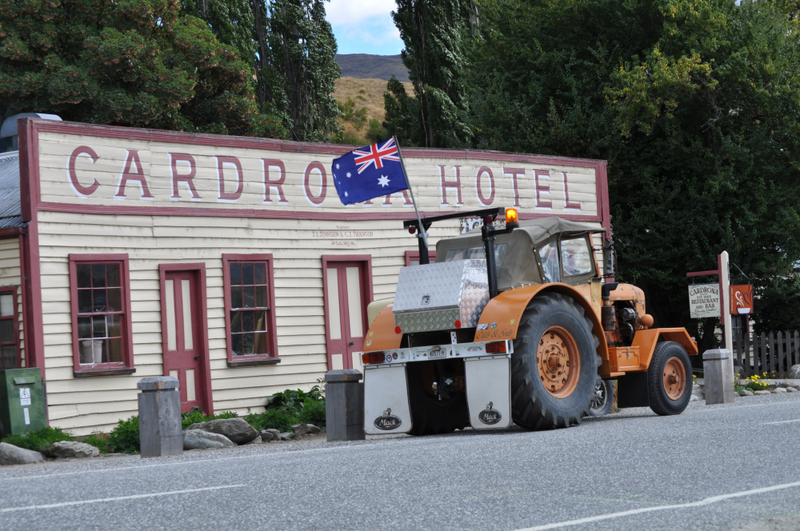 The historic hotel at the Pass was in a very lovely setting and well worth the visit before we continued along a very windy track into Duntroon for lunch. 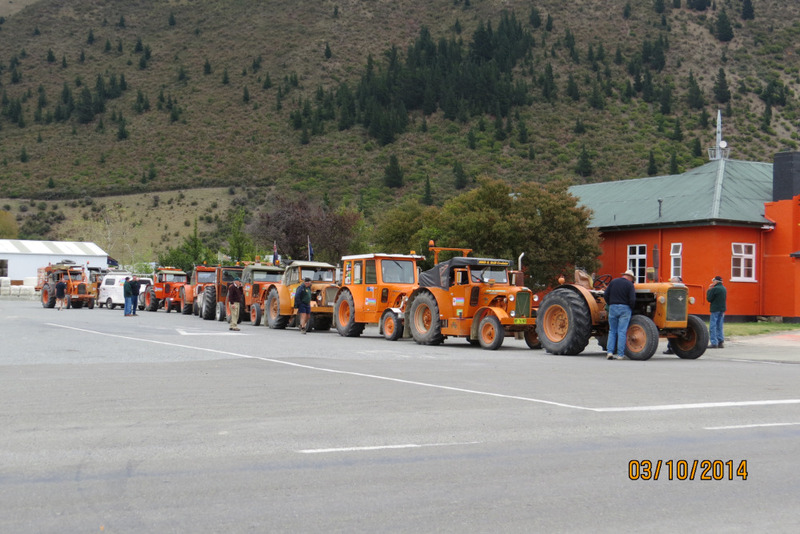 The run into Kurow was timed so that the tractors could make a run down the main street, then a couple of tractors visited the children at the local primary school – always a hit with the kids. 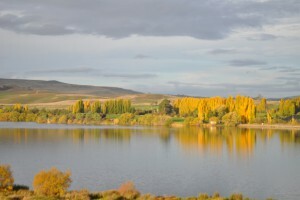 Viv had recommended that the trekkers visit Lake Blenmore, the largest in a line of very picturesque lakes north-west of Kurow. 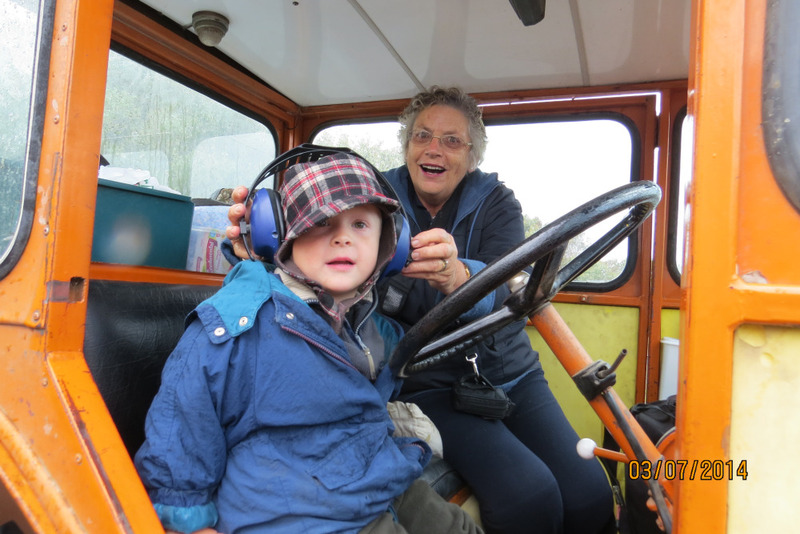 With the azure blue of the lakes and the trees just showing their autumn colours, this was a particularly relaxing outing. 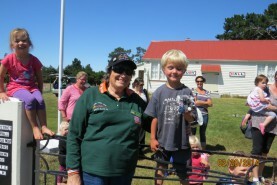 We were pleased to catch up with the area representative for the Child Cancer Foundation, Elaine Horn, who, along with the local community members, had arranged a BBQ meal for our group and other interested locals as well as Sarah from the local press. 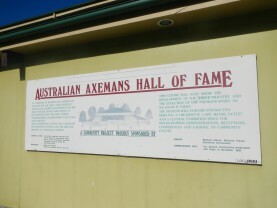 This was a very well presented and received meal and another very enjoyable occasion. 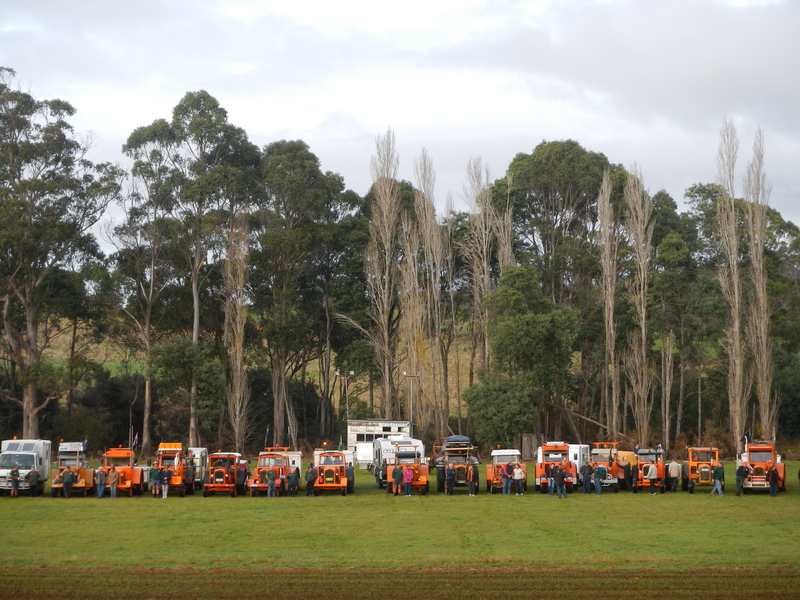 Day 22: March 12th – Lay day at Fairlie. This was a rare opportunity to go separate ways to take in the very beautiful scenery in the area around Fairlie. 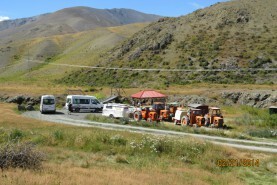 A good few of the group found their way to Lake Tepako, others to Twizel and some to the coast at Timaro, while some just took advantage of the day to prepare for the end of the trek in a few days’ time. 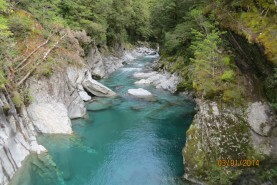 One could spend several days in this area and not see it all. 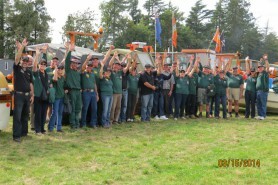 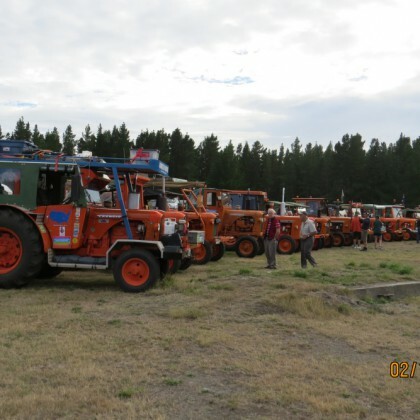 As an almost end of trek event, the Eastern Branch invited all the trekkers to a BBQ at the Pinewood Motels where the tractor crews had their accommodation. 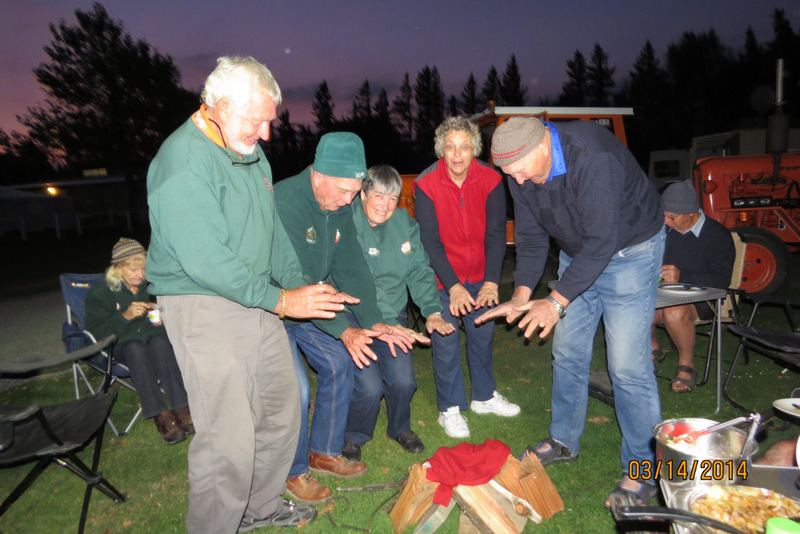 This was a real feast with fresh salmon cooked to perfection and lots of other great food – a good night was had by all, wound up by Brenda’s rendition of a NZ version of the old 9G song. 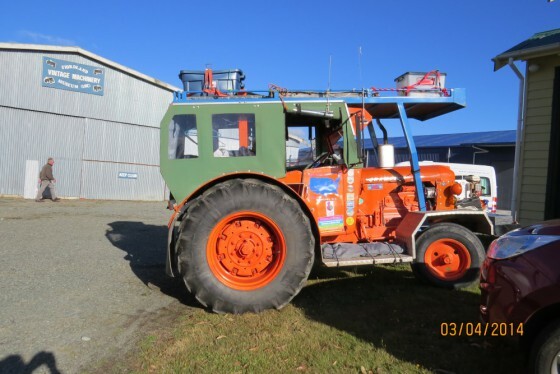 Day 23: March 13th – Fairlie to Methven via Geraldine. This morning the trekkers were invited to visit Roger Mahan’s property to see his collection of machinery and enjoy his panoramic views across the countryside to the mountains in the far distance. 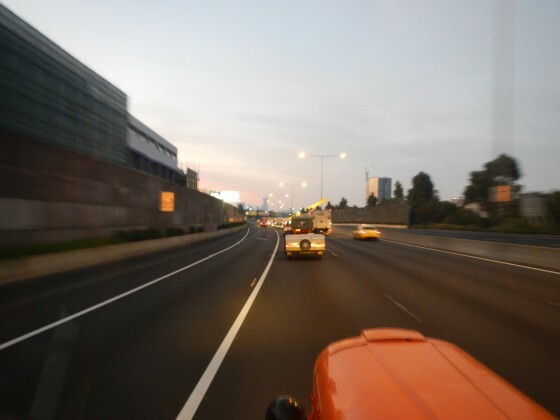 Fortunately it turned out to be a fairly clear day. 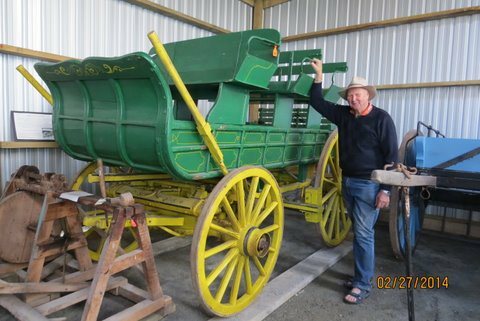 Next stop was to visit the Geraldine Vintage Car & Machinery Club Museum which lived up to it’s reputation for having many rare and interesting modes of travel – cars, motorbikes, tractors – even an undertaker’s side-car complete with coffin! 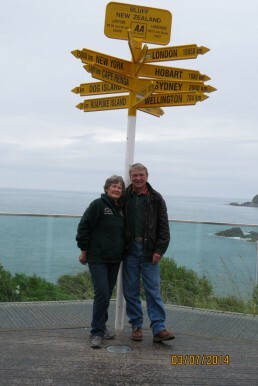 Some of our group was lucky enough to visit a local couple’s very beautiful garden along the way. 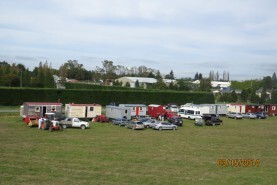 The Methven showgrounds had arranged space for our tractors and motor homes and the Vintage Club hosted us to a very enjoyable evening complete with a roast dinner and desert, slides on various tractors with their history and even a slide-show on trekking to Everest and a talk on kite flying. All up a great night and an opportunity for both Neville and Ron to extend thanks not only to this club, but also to all those who have helped this Kiwi Trek 2014 become a reality. Day 24: March 14th – Lay day at Methven. All of the New Zealand COG members who have joined us in Methven and some of the Australian contingent headed up the track to the Mt Hutt Ski-fields. 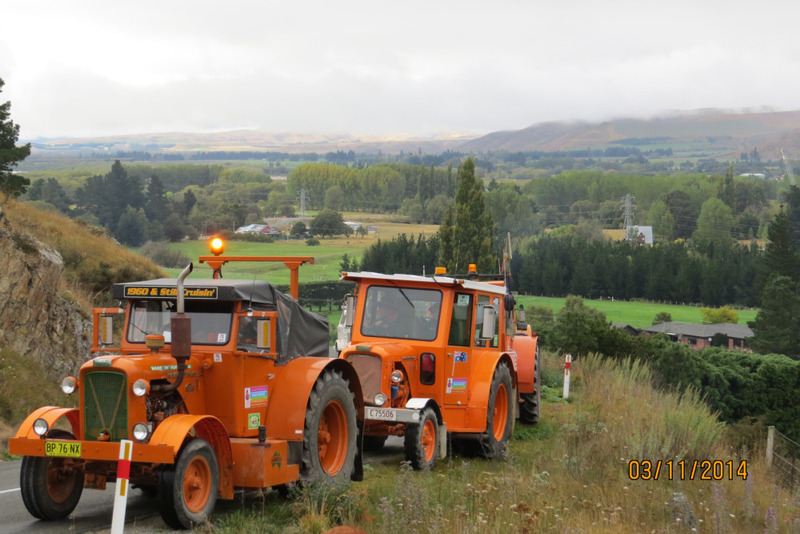 The first part of the way was deceptively easy over sealed road but the last 14 klms became increasingly steep as we headed up the hill. 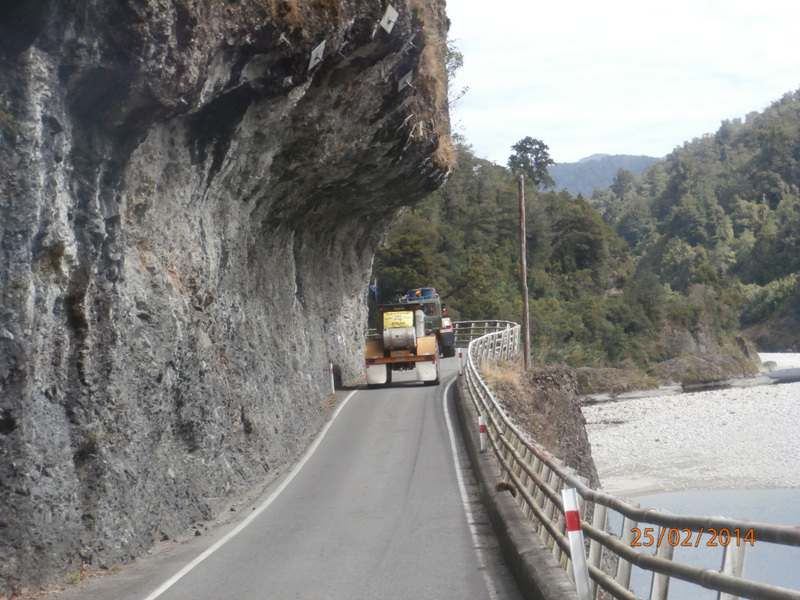 It did not pay to look down around some of the bends – it was a very long way to the bottom! 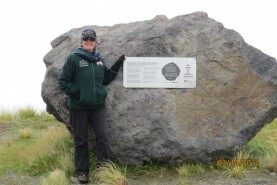 We stopped at ‘Rocky’, the huge rock which ran down the hill into a home in Christchurch in 2011 and has since been moved to a location overlooking the city from the track. 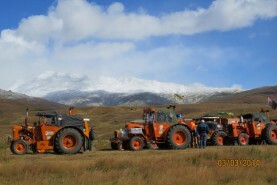 The NZ Ski Company paid $50,000 to the earthquake appeal and had it transported up to its current site. Then it was an even steeper run to the top where we were given an informative talk by the manager of the site. Even without snow, this is a very impressive place to visit – we were surprised to learn that all staff members make the journey up the hill each day, with some staff being employed all year around. 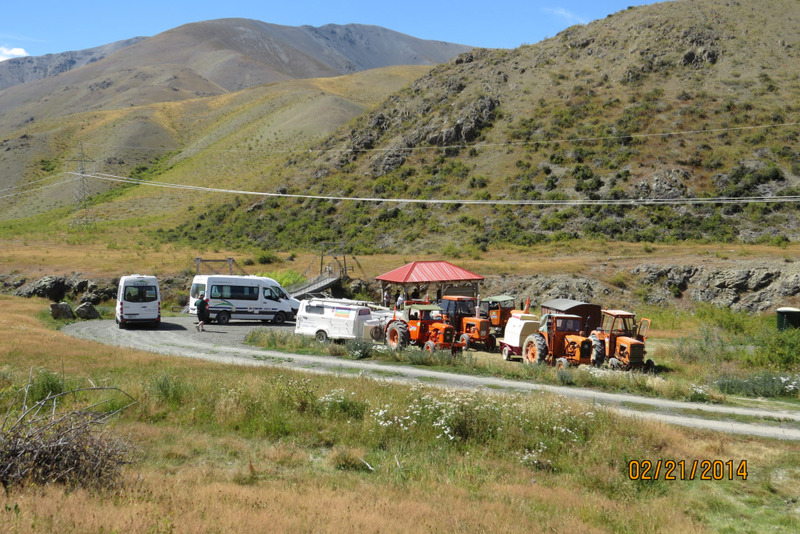 Having successfully made it back down the hill, we visited the Rakaia Gorge where some members of the vintage machinery group brought lunch – a welcome stopover at a very picturesque place. 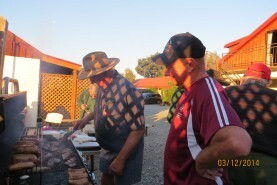 For the last evening of the trek, some members of the group visited a restaurant in town, while others had a BBQ and ‘pretend’ campfire at the campsite – all good fun. 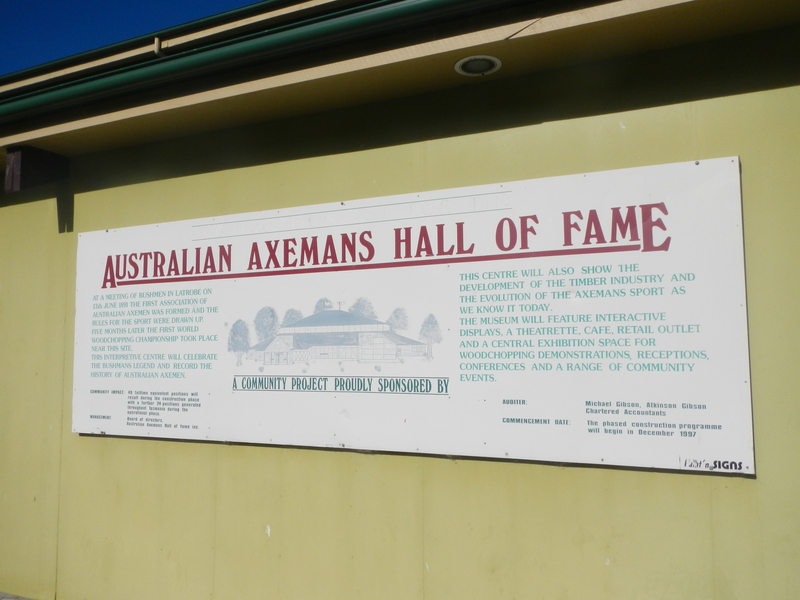 And in conclusion …………………. 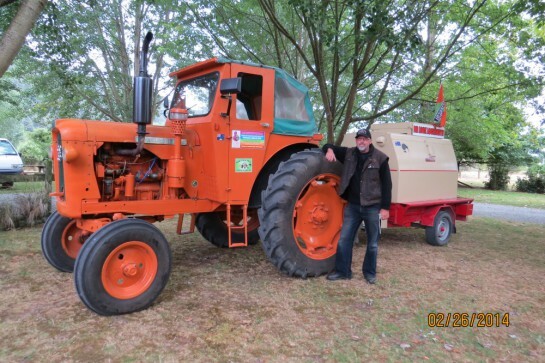 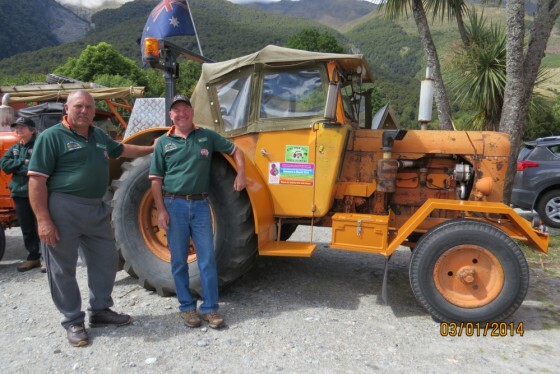 The Chamberlain 9G Tractor Club of WA Inc would especially like to extend our thanks to the North and South Island Chamberlain owners who have participated in this trek. They have instilled a local flavour into the event and have been great ambassadors for this beautiful country. 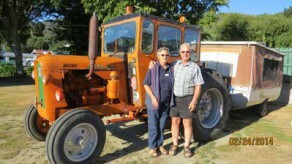 We have enjoyed their company immensely and look forward to continued relationships. 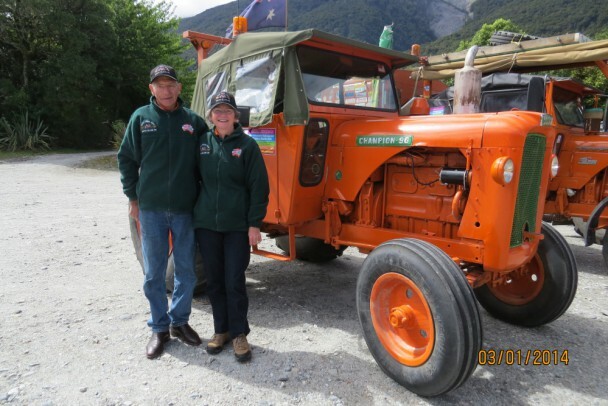 Thanks also to the members of the Child Cancer Foundation of NZ for allowing us to use our trek to raise much needed funds for those children who have been affected by cancer in New Zealand. We are pleased and proud of our final collections total of $14,950.60, which when added to Steve Day’s own total of $3044.44 gave us a total well in excess of our expectations. 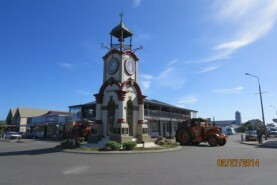 Deloraine, Westbury where we went through Pearns Steamworld , Shaw Tractor Shed , travelled on to Longford. 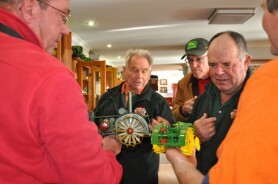 Had a coach tour of Launceston Cataract Gorge, SwissVillage, Motor Museum and of course ladies do shopping. 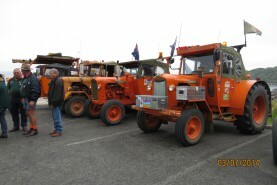 Left Longford heading along West Tamar Highway to Becketts Mining and Civil Contractors, huge amount of machinery here. Then just up the road a sawmill in Exeter. 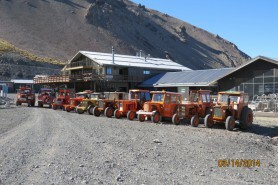 Then onto Beaconsfield Gold and Mining Heritage Museum. 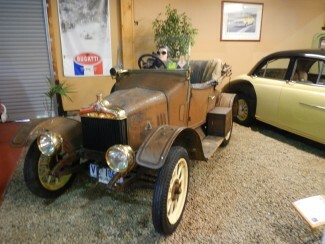 Pulled into Goaty Hill Winery and very warmly welcomed. 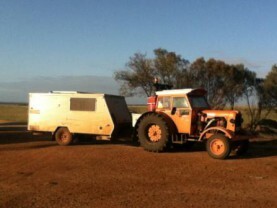 Onto Pipers River for the night, on another farm. 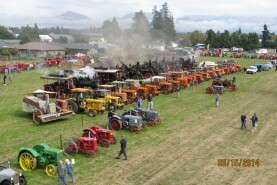 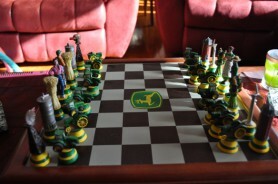 This farm is a conglomerate owned by R.C.Rowlands. 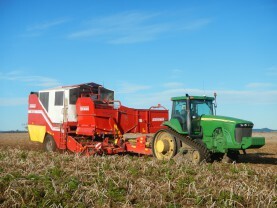 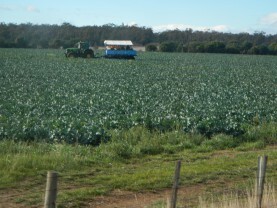 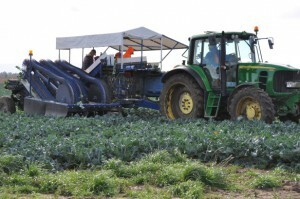 Saw potatoes being harvested on the farm and they are getting 20-23 ton a hectare. All taken to Olverston where they handle 350,000 ton from Jan to June. 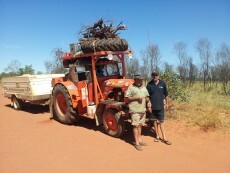 Leave Pipers River for Bridport, morning tea stop Bridport then onto Gladstone for lunch. 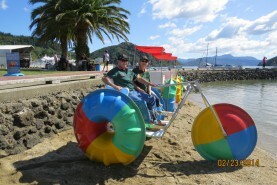 Travel from Gladstone to Anson’s Bay then onto St Helen’s in caravan park. 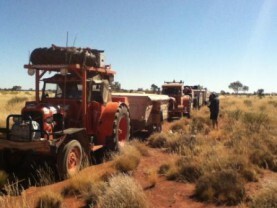 But on the way to Gladstone 22ks out had to put a head gasket in Well Bugger Me, the men looked like bees around a honey pot, in no time it was going again. 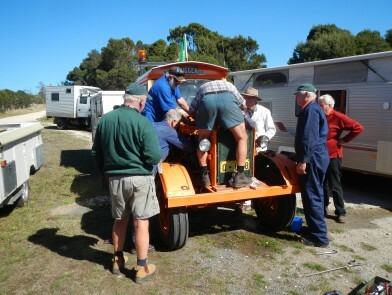 But then Clearveiw had a fuel leak so all hands on deck again, by passed the original tank to spare one. 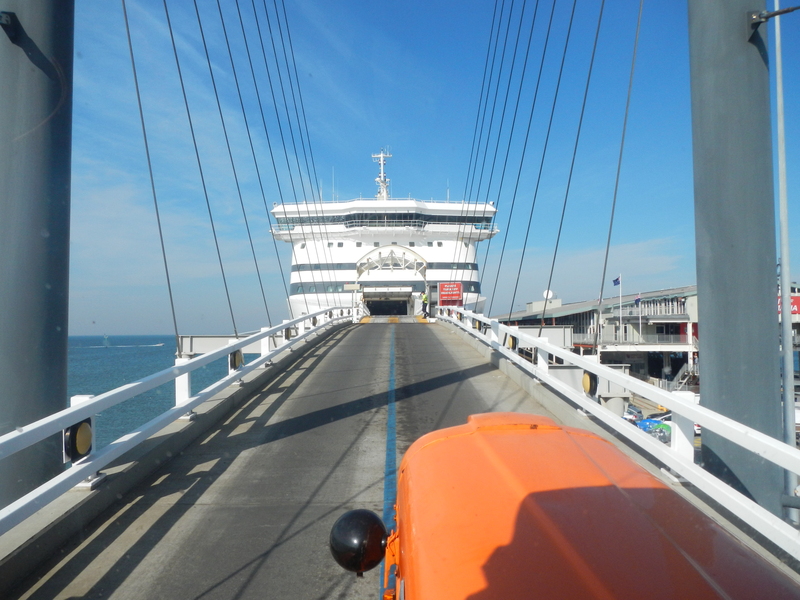 So off we go finally. 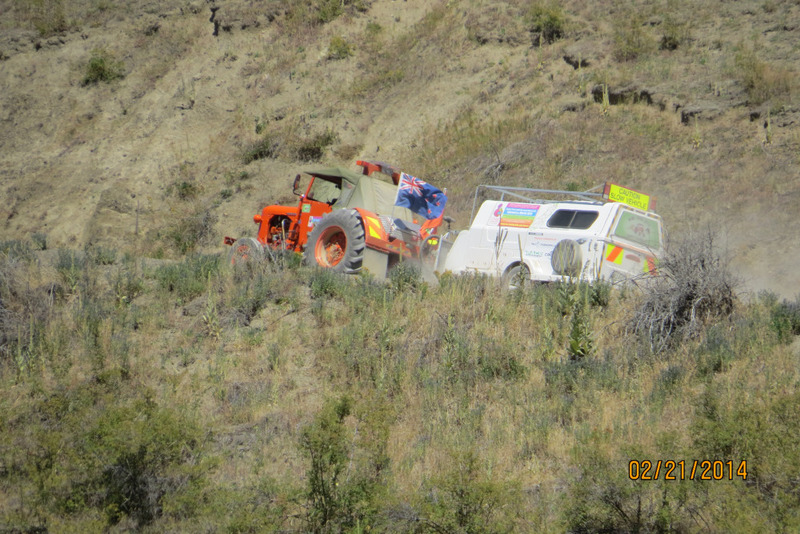 But Barrie Hall and Helen Taplin are having a steering problem which they thought they had corrected overnight. 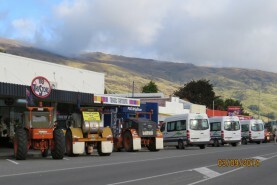 Leave St Helen’s heading for the shops and Well Bugger Me has another fuel blockage and two men that had pulled up to have a look told us we had the muffler hanging down must have happened when they did the head gasket. 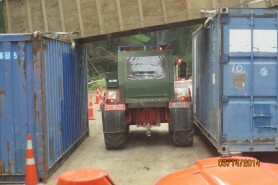 So the guy said drive it out to my unit and he would weld it for us, very nice of them, so off again. 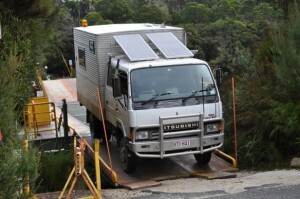 But had 2 more fuel blockages but then went for hours without stopping. 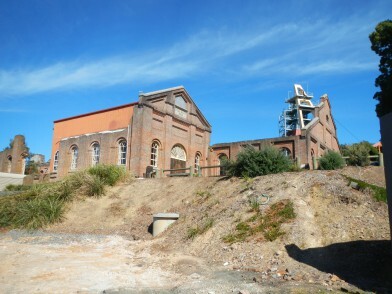 Called in to Brewery at White Cliffs Estate. 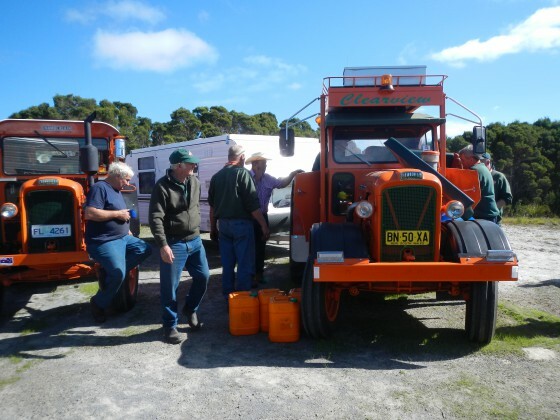 Head south to Bicheno for lunch where the guys put a steering box in Barrie Hall and Helen’s tractor in a small park in the main street. Well we must have had the whole population of Bicheno watching them. Collected money in our collection tins as well. 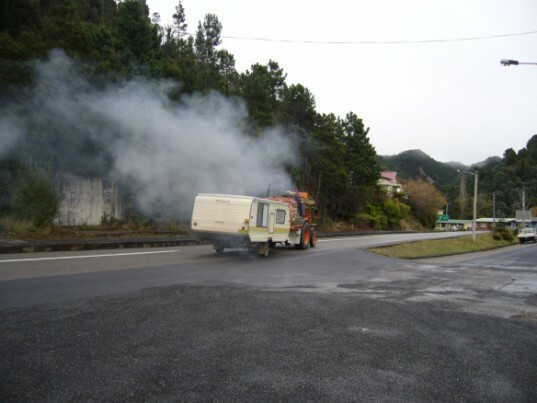 Change of plans now heading to Swansea for the night in caravan park.